Yesterday evening, the Pawtucket Red Sox announced that Friday’s game on June 10 would be “Free Brady Friday.” This is, of course, a reference to the Infinite Jest of sports scandals, the absurd dystopian opus that just keeps on giving: Deflategate. As satirical current events-related sports scandal-themed promos go, this one is pretty tame. Fans named “Tom” or “Brady” will be admitted to the game for free, and $13 box seats will cost $12 in honor of Brady’s uniform number (of that $12 ticket price, the PawSox will donate a “quarter back” to the Brady-supported “Best Buddies” charity). Today, in what is the International League promo equivalent of a rap battle, the Buffalo Bisons played Drake to the PawSox’s Meek Mill. June 11, a doubleheader vs. the Charlotte Knights, is now “Keep Brady Suspended Night” at Buffalo’s Coca-Cola Park. Here’s hoping the PawSox will soon respond in kind, escalating this promo battle royale into even more rarefied air (or lack thereof). Good thing, though, that the Bisons hail from Buffalo, as nothing has occurred during that city’s long and distinguished football history that anyone could possibly make fun of. 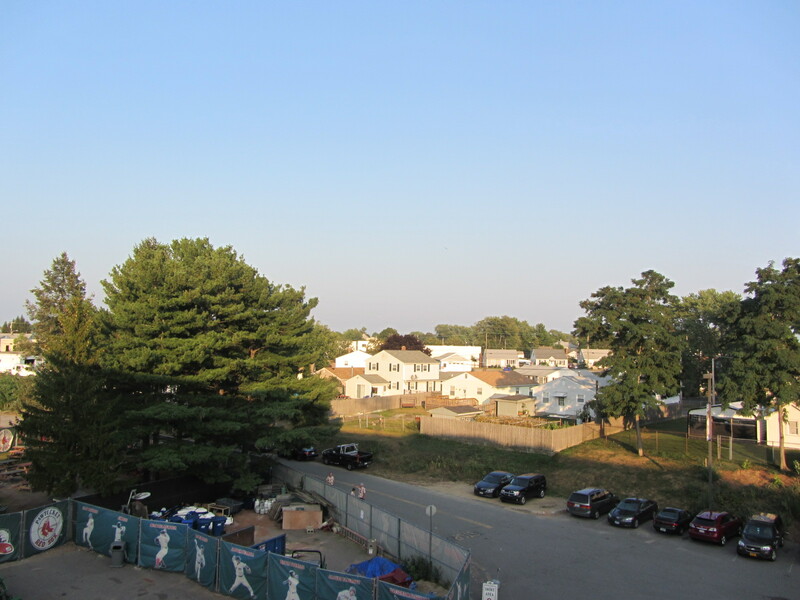 To see all posts from my September 1, 2015 visit to the Pawtucket Red Sox (this is Part Three) click HERE. To see all of the posts from my August/September 2015 trip through New England, click HERE. To see ALL of my “On the Road” posts (going back to 2010), click HERE. 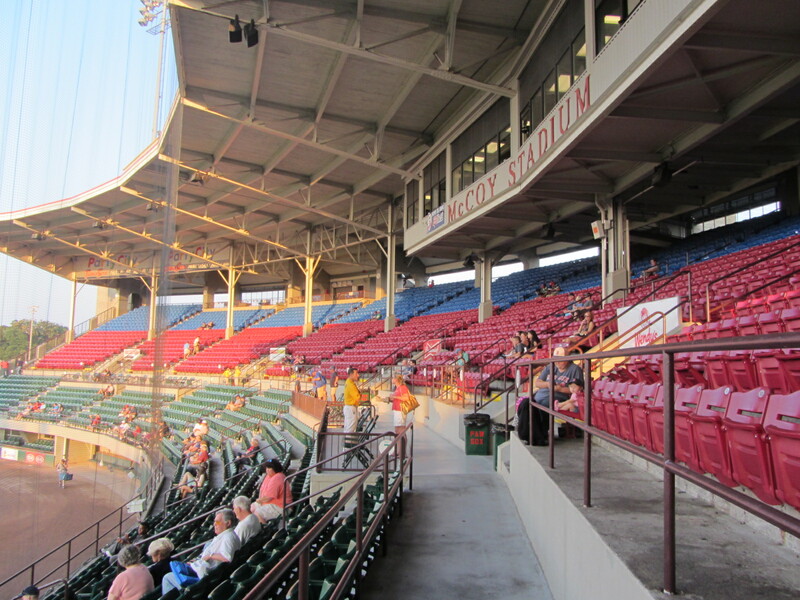 The longest baseball game in professional history was played at Pawtucket’s McCoy Stadium. 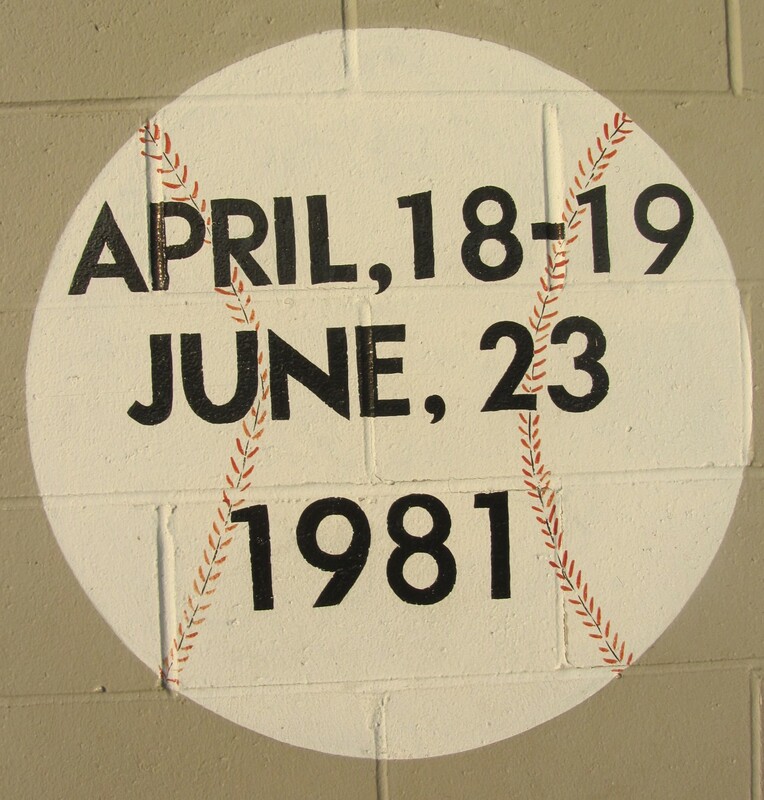 The 33-inning affair began on April 18, 1981, continued into the wee hours of the 19th and was finally, mercifully, completed on June 23. 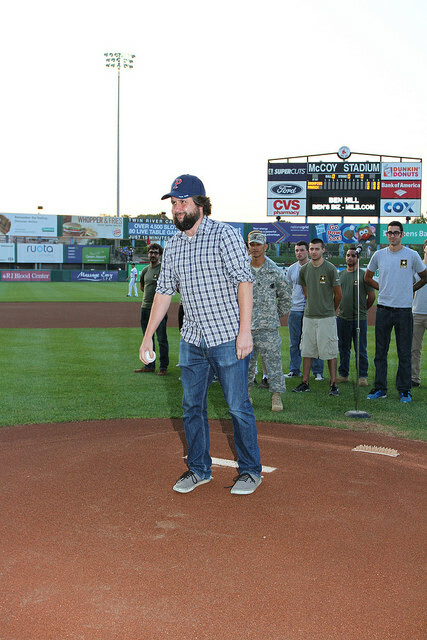 Undoubtedly, this was the most monumental event to ever take place at McCoy Stadium. The second-most monumental event occurred on September 1, 2015. 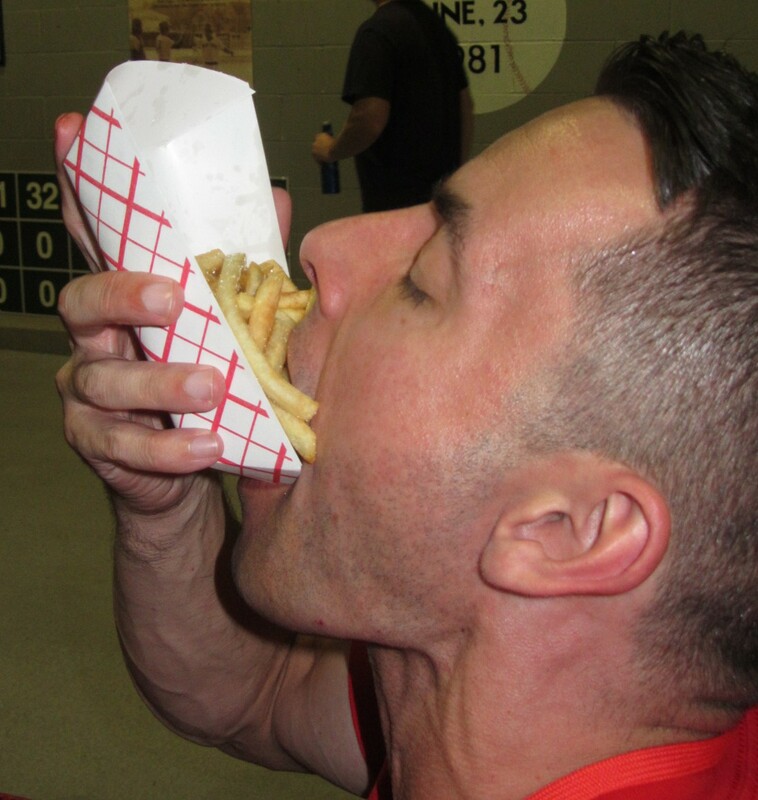 On that evening, as the PawSox played the Lehigh Valley IronPigs, one Brian O’Connell served as my designated eater. 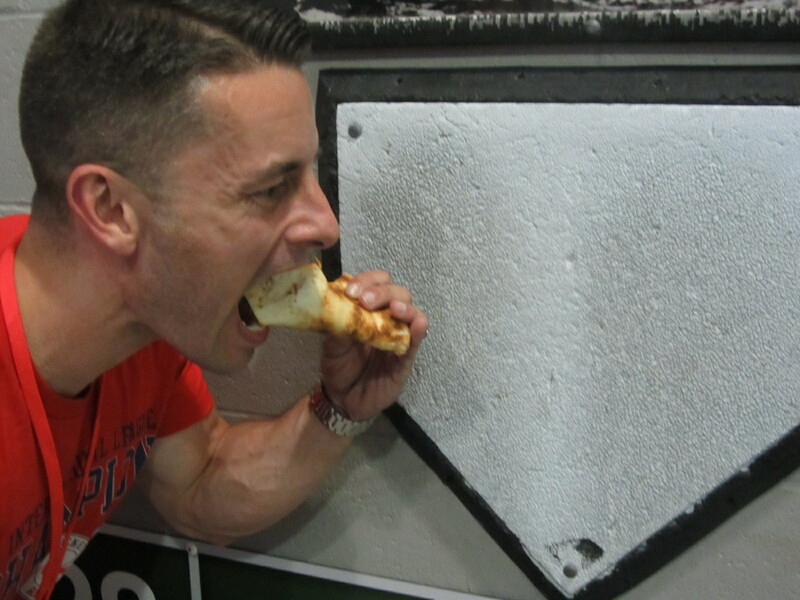 As designated eater, it would be Brian’s task to consume the ballpark cuisine that my gluten-free diet prohibits. As you can see from the above picture, he’s in good shape and doesn’t appear to be the sort of guy who gorges himself on concession stand fare. But he was up for the challenge. Brian is a Providence native who now lives in nearby Swansea, Massachusetts. 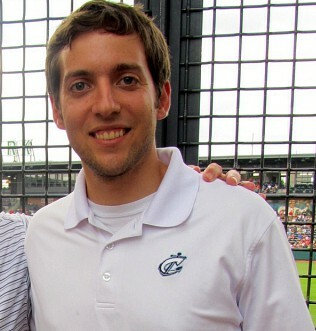 He works out of Providence as a legal admin, and is also a soccer journalist whose work appears on the the website nesoccertoday.com. (In my notes this read “anysoccertoday.com,” which would be a good resource for those curious about game times and what not). When it comes to their food offerings, the PawSox are significantly less crazy than an enraged Izzy Alcantara. 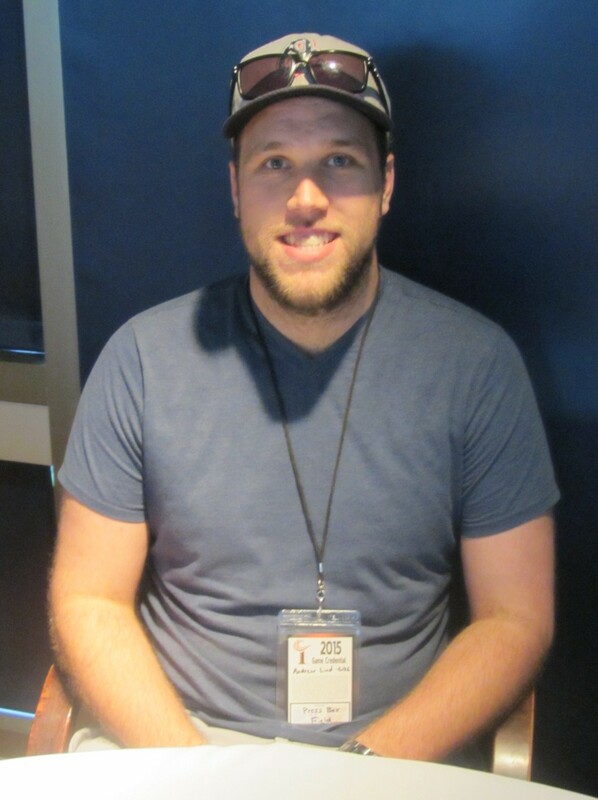 Eric Petterson, the team’s director of concessions, said that the basics are king. 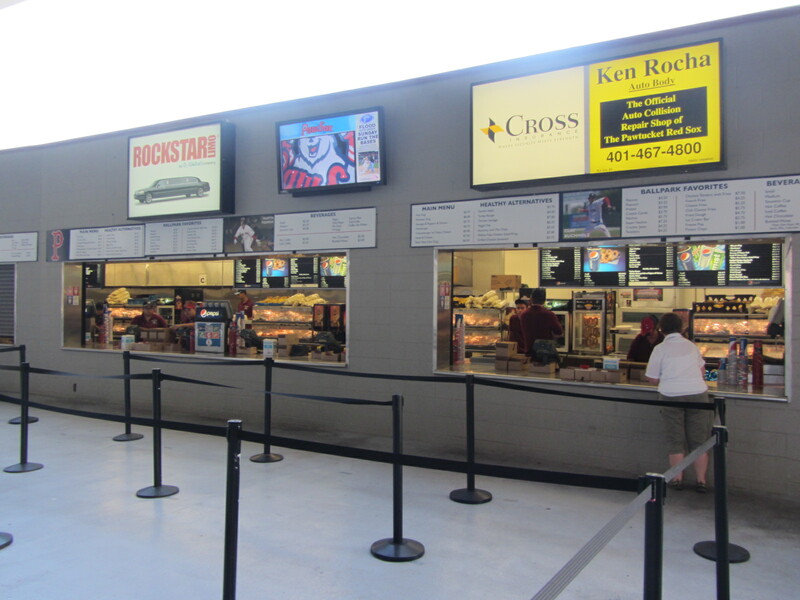 Hot dogs, supplied by Kayem, are the number one offering at concourse stands such as these. 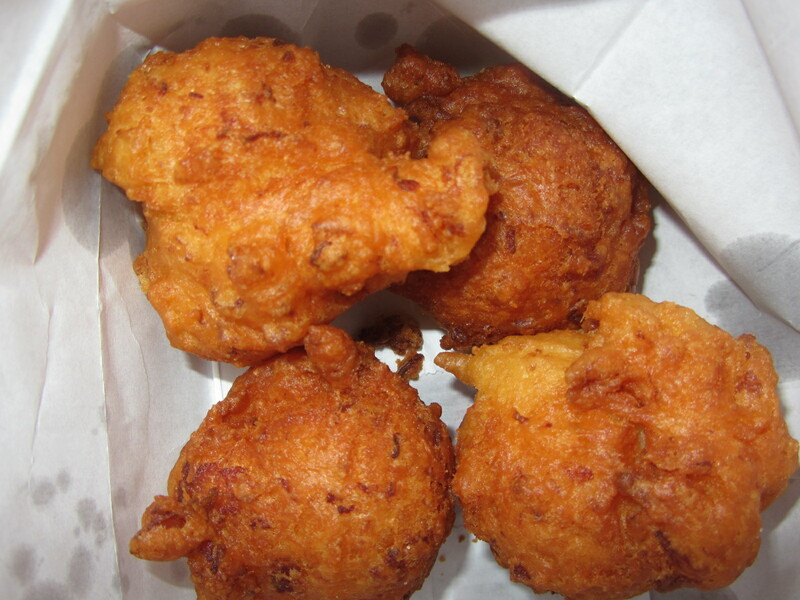 The clam cakes are supplied by Blount, a Rhode Island-based clam shack with four area locations. The only thing more quintessentially New England than eating Blount clam cakes out of a white paper bag is dipping said clam cakes into a cup of Blount clam chowder. Brian was excited to try this time-honored combination. 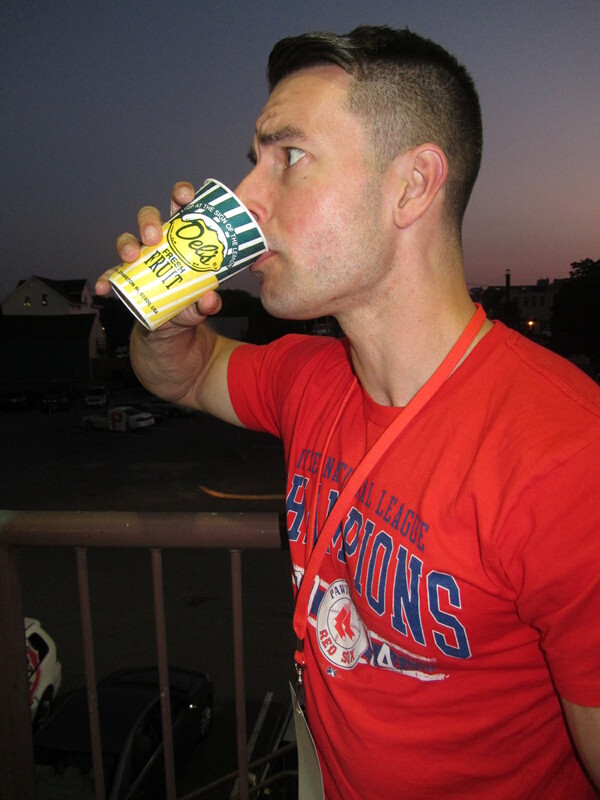 Brian washed down his clam combo with Del’s, a regionally-beloved brand of frozen lemonade. I’m not sure why he looks so concerned about doing this. 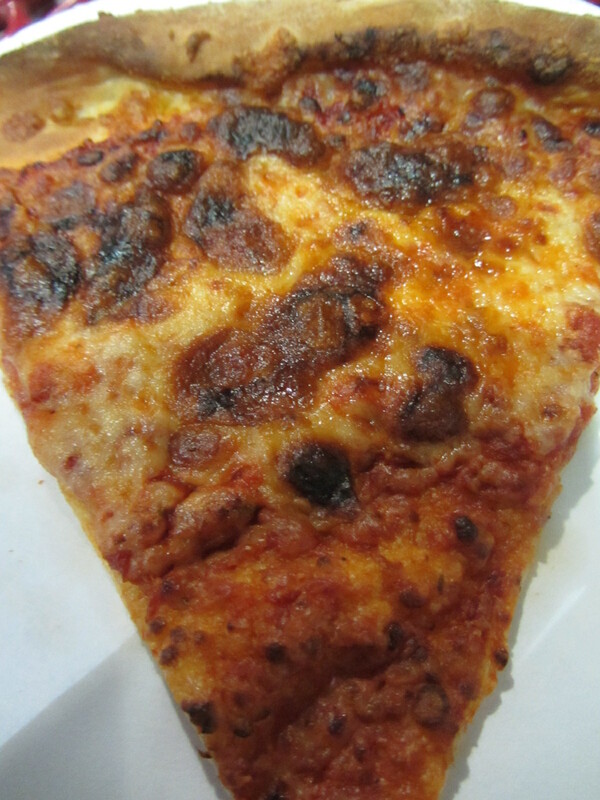 We move on from that piece of information to a piece of pizza. PawSox pizza is supplied by Portland Pizza, which Brian called “an upgrade over Papa Gino’s.” I’ll let you Rhode Islanders out there (all couple dozen of you) argue that one out. But no matter what the brand, it’s better to eat pizza off of a plate. 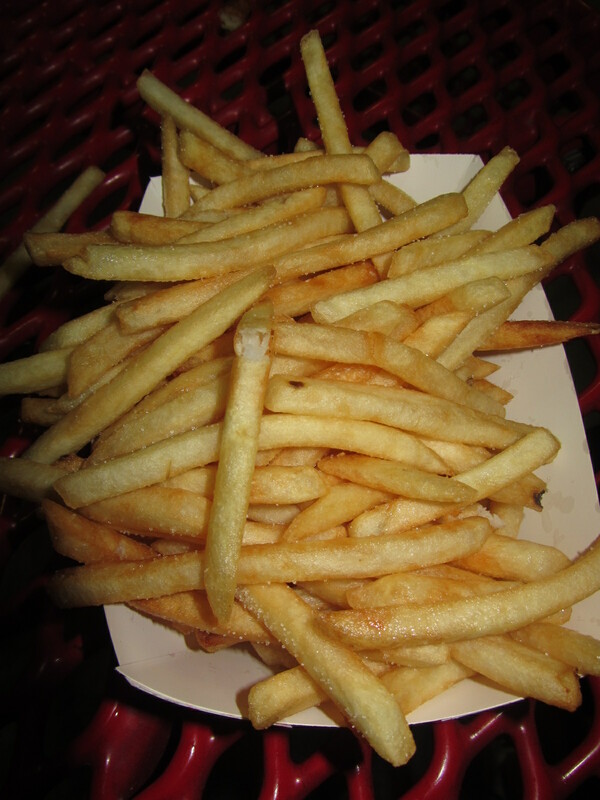 We were gonna call it a night after the pizza, but Eric suggested that Brian eat some fries. Brian’s appetite only seemed to be growing. He was a voracious eating machine. 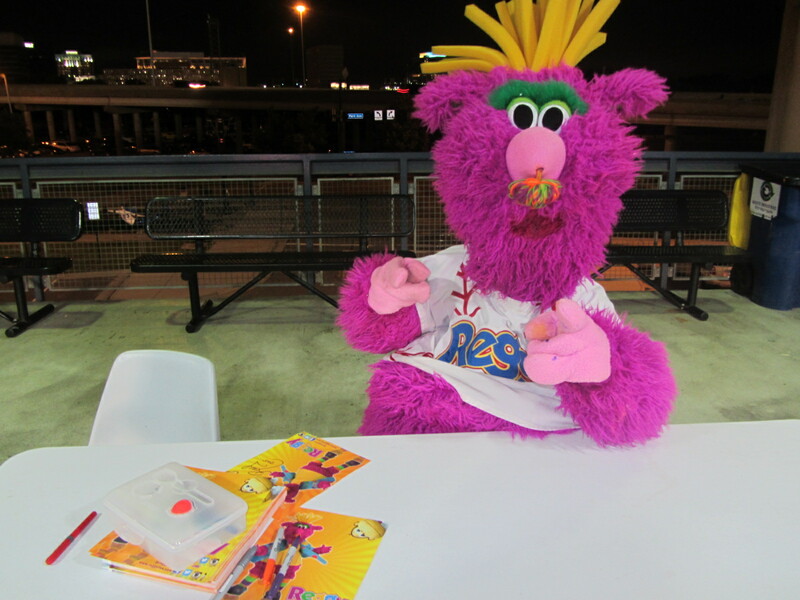 After taking a hearty swig of Del’s, Brian gave his final thoughts on the PawSox designated eating experience. Oh, and speaking of super local staples, Brian suggested that the PawSox should offer the Rhode Island specialty that are Coney Island System hot dogs (also known as “New York System” or simply “Hot Wieners”). 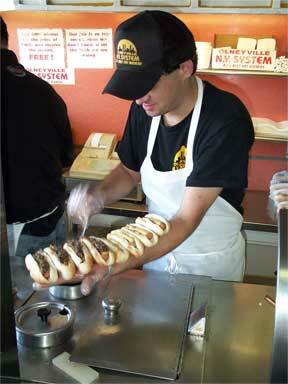 The future of PawSox concessions? Brian can dream. 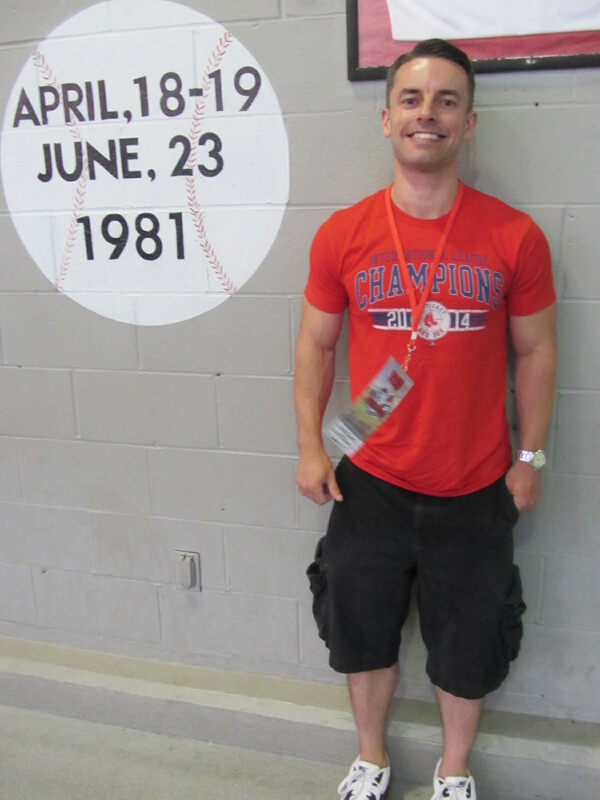 To see all posts from my September 1, 2015 visit to the Pawtucket Red Sox (this is Part Two) click HERE. To see all of the posts from my August/September 2015 trip through New England, click HERE. To see ALL of my “On the Road” posts (going back to 2010), click HERE. 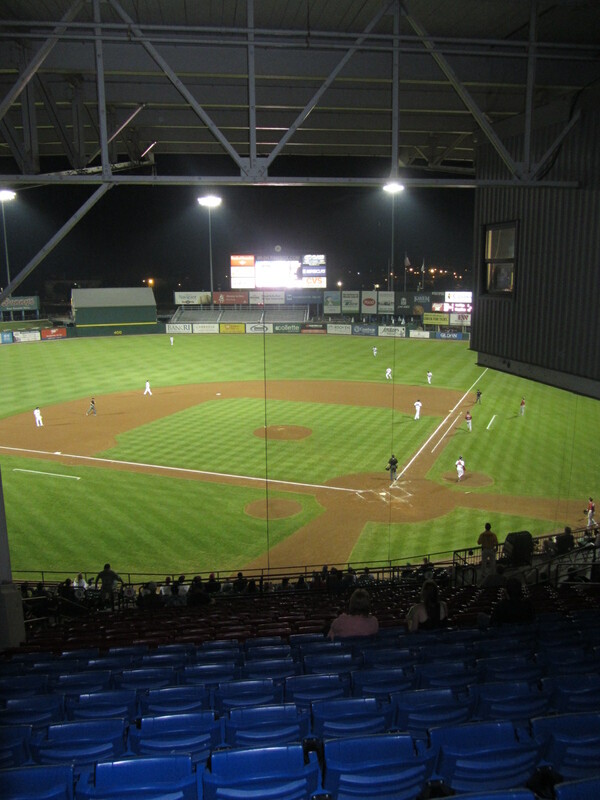 The previous PawSox post was a lengthy and discursive overview of both team and stadium history, interwoven into a contextualizing “pregame wandering” narrative. No promises, but it is my intent to keep this post — Part Two in the series — short and simple. 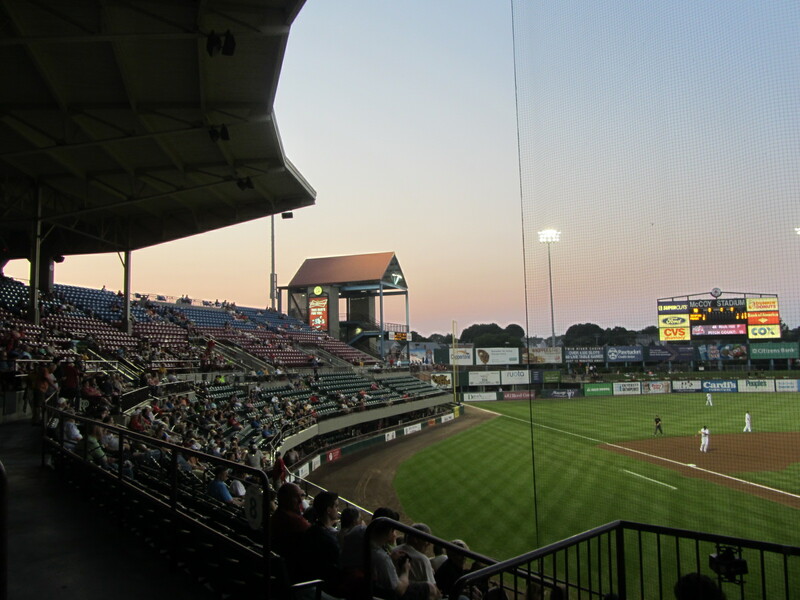 It was September 1, 2015 and the PawSox were taking on the Lehigh Valley IronPigs in a Tuesday evening contest. Both teams were out of postseason contention, but the show must go on. Let us now take a look to the left. I mean, why not? I spent the first several innings of the ballgame in close commiseration with my designated eater (you know, the individual who consumes the ballpark cuisine that my gluten-free diet prohibits). That will be documented in the next post. By the time I returned to the stands, darkness had descended upon us all. 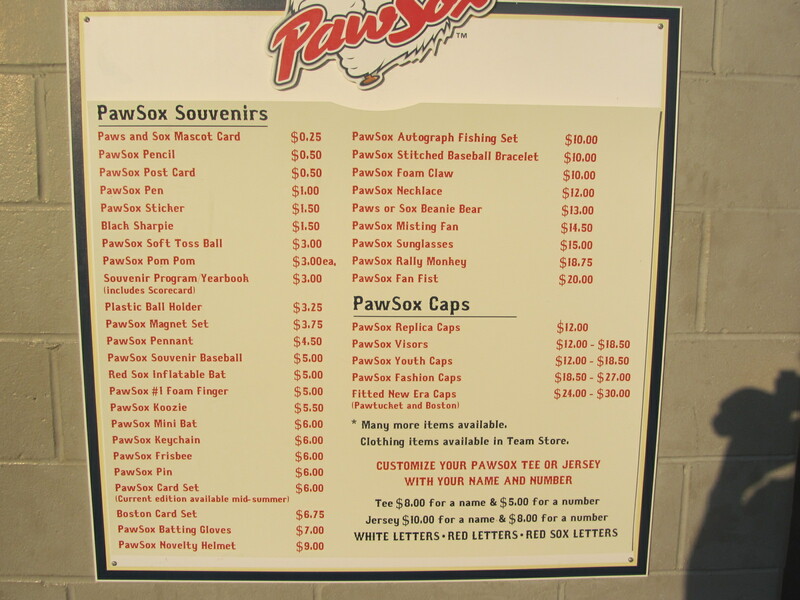 I then spent the next couple of innings cataloging the observations of longtime PawSox fans dismayed at the team’s proposed move to Providence. Read all about it. These conversations were followed by a requisite bout of wandering, which eventually brought me to the outfield berm. I thought that the above Vine came out really well, and that people on social media would pick up on it, but that didn’t happen. Oh, well. I’m used to it. I’ll just be out here by my lonesome being brilliant, for however long it takes for the world to catch on. I’m like the Melville of baseball bloggers, and while there are distinct downsides to one’s legacy being posthumous it just shows that I’m ahead of my time. Seeking the mental clarity that often results from a new perspective, I made a rapid ascendance to the top of the stadium. The PawSox were wrapping up a speedy 10-2 victory over the IronPigs. Rich Hill, who I interviewed a decade ago, struck out nine over seven innings and earned the win. The game may have been over, but the evening would not be complete without a Groundbreaking and Subversive Ballpark Joke. On the way out of the stadium, I passed through yet another shrine to the long and distinguished history of McCoy Stadium. As mentioned in the last post, this kind of stuff can be found all throughout the ballpark. It is a living museum, in perpetual celebration of itself. 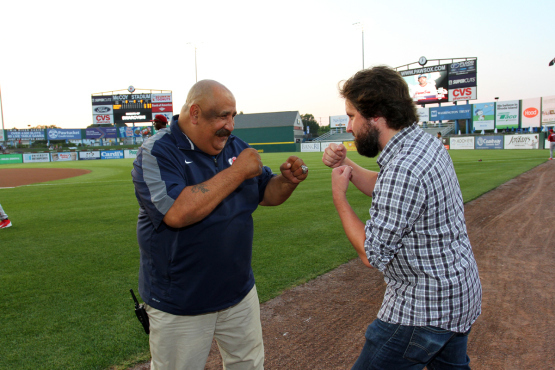 Outside the ballpark, I spent a few minutes cruising around in a golf cart with PawSox director of security Rick Medeiros. 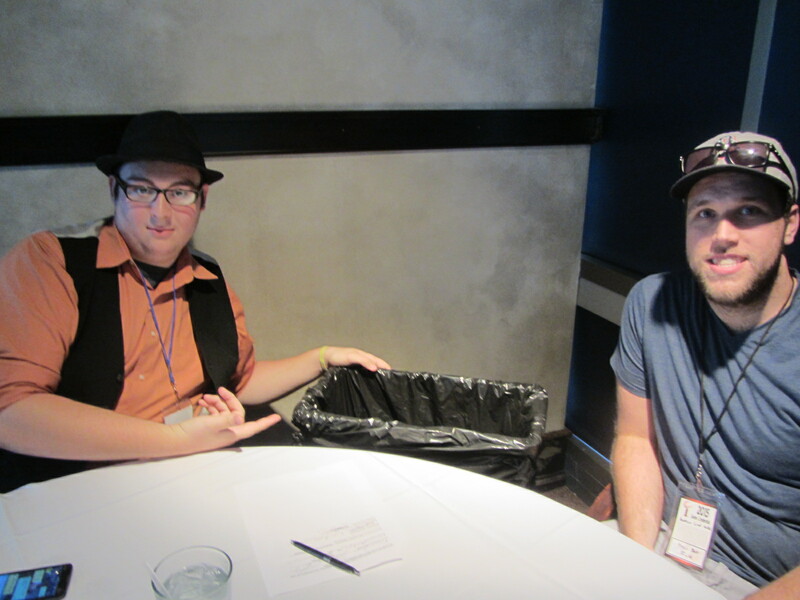 Rick, in addition to being a likable and outgoing guy, is a fellow blogger. 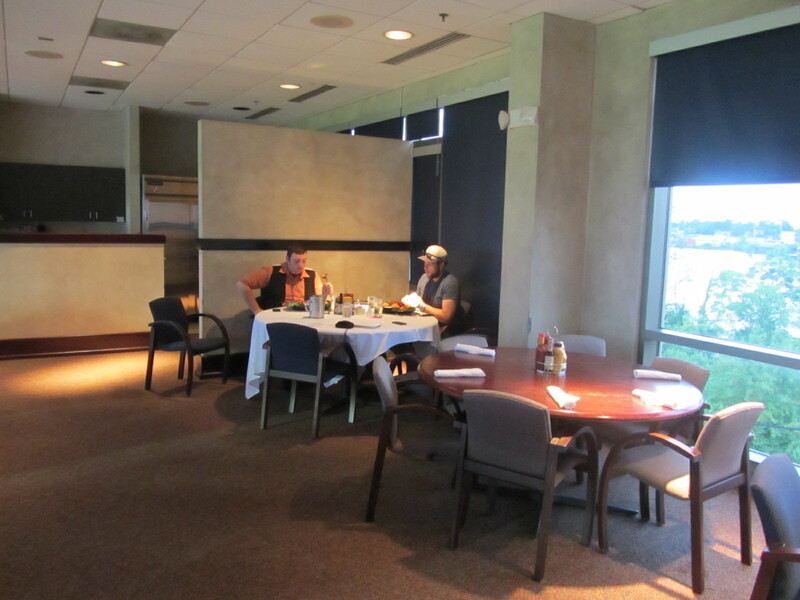 Check out his “Rollin’ With Rick” blog, which recently dedicated a post to my evening at McCoy. 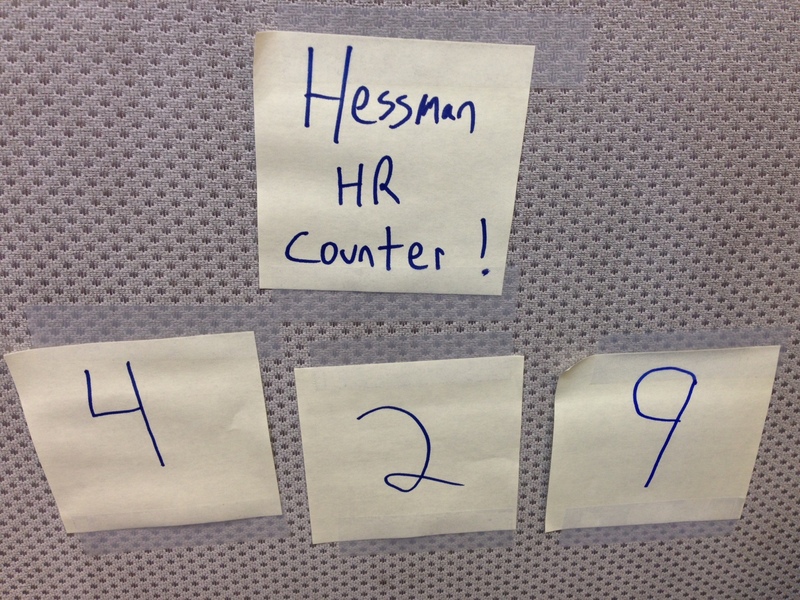 One of Rick’s long term goals is to dethrone me from my #1″MiLB Pro” ranking on MLBlogs, but I’m ready for the fight. I’m ready for a metaphorical fight, at least. In a real one, Rick would knock me out no problem. Anyhow, outside in the parking lot after the game, Rick and I kept tabs on the nightly autograph scrum. I’d never seen this before, but the PawSox have established a separate “kid’s only” autograph line. That’s a pretty cool innovation, as it gives them some separation from the middle-aged adults who comprise the majority of the autograph collecting ecosystem. 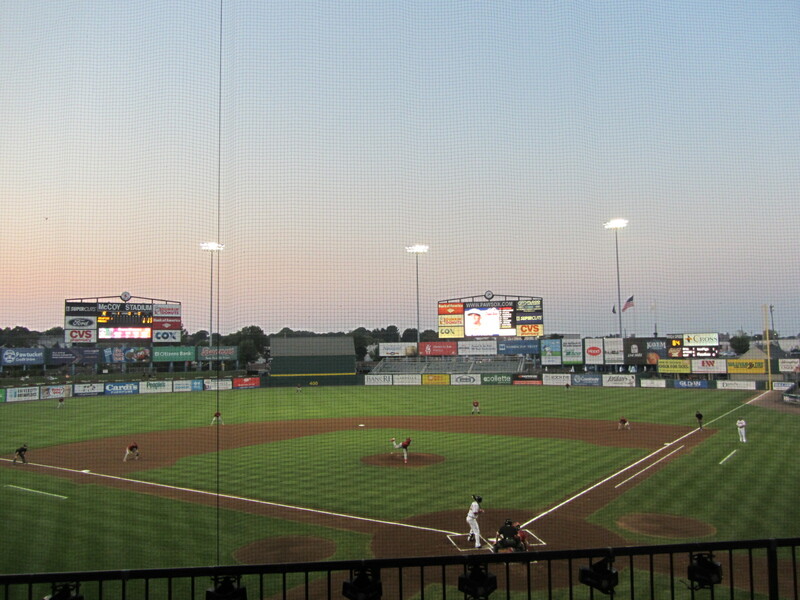 And that just about did it for my one (and thus far only) evening at McCoy Stadium. 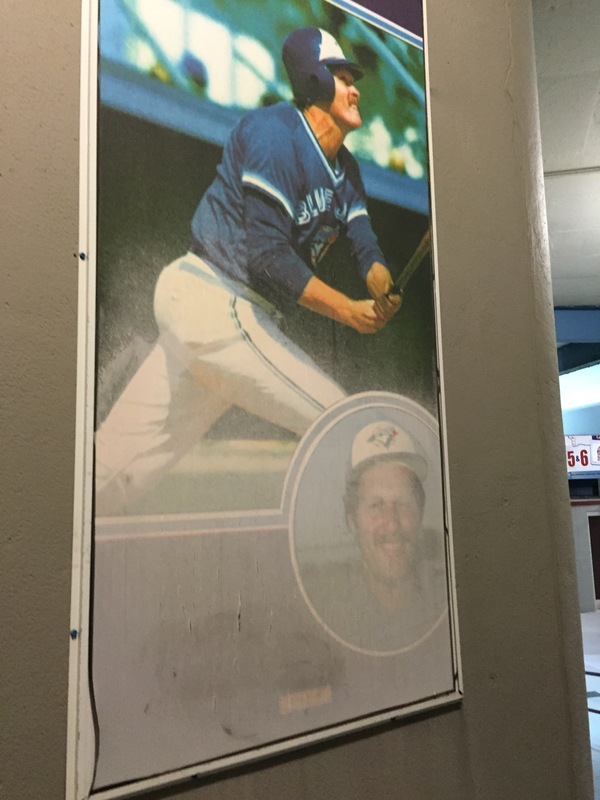 On behalf of a faded concourse image of Ernie Whitt, I bid you all goodnight. 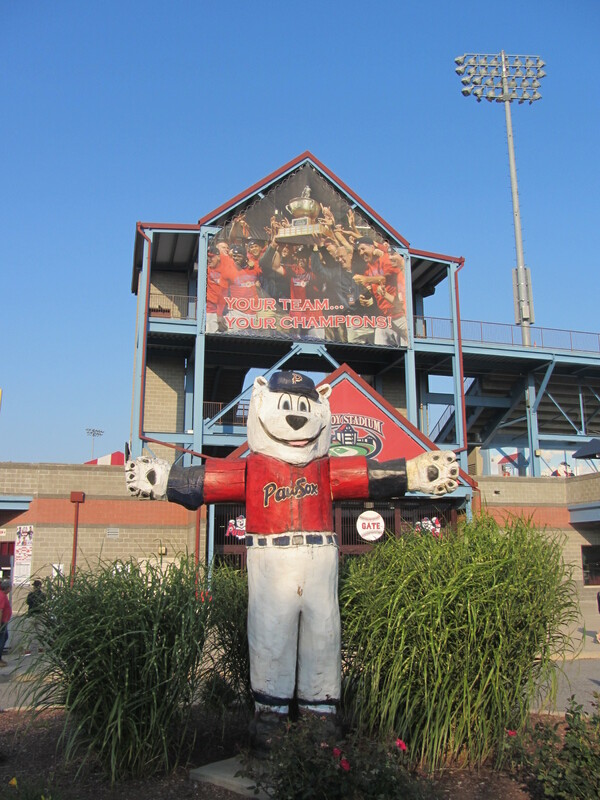 To see all posts from my September 1, 2015 visit to the Pawtucket Red Sox (this is Part One) click HERE. To see all of the posts from my August/September 2015 trip through New England, click HERE. To see ALL of my “On the Road” posts (going back to 2010), click HERE. The fourth stop on my fifth road trip of the season marked the first time that my Minor League travels had taken me to Rhode Island. There is only one Minor League Baseball team in Rhode Island, and that team is the Pawtucket Red Sox. 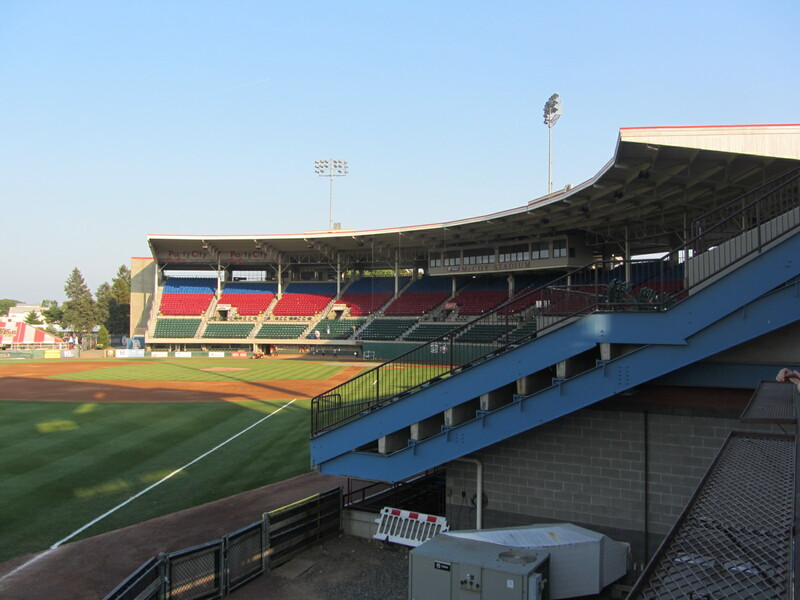 The PawSox, as they are often referred to as, have spent the entirety of their existence at McCoy Stadium. 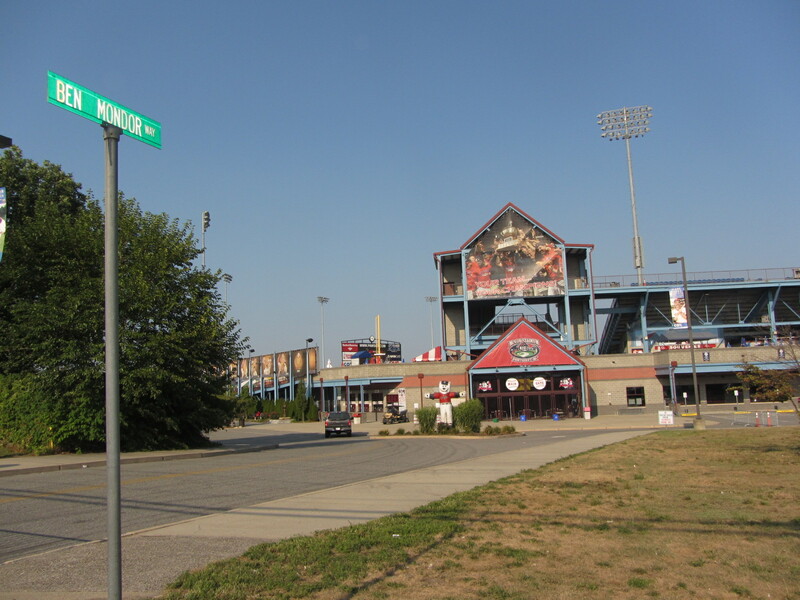 As you can see in the above photo, McCoy Stadium is located on Ben Mondor Way. 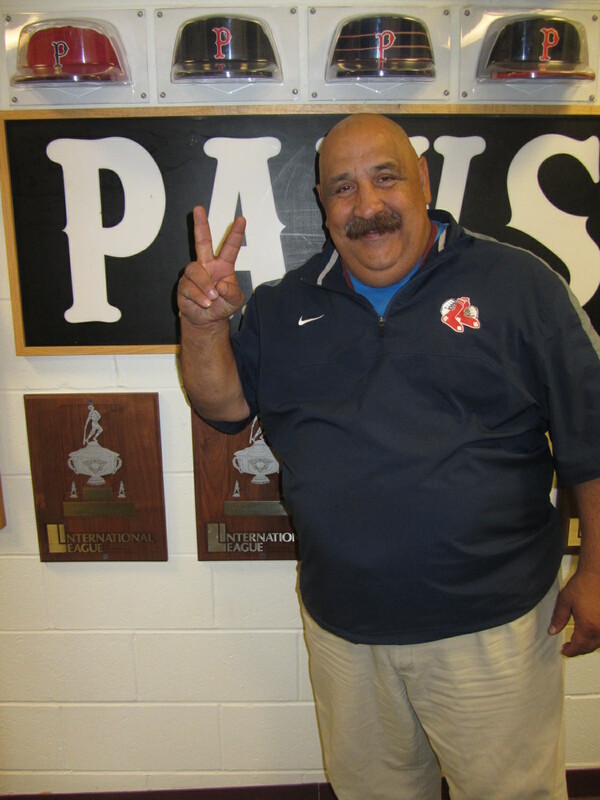 Ben Mondor bought the PawSox in 1977, when their financial situation was dire, and turned the team into one of the most well-regarded operations in the industry. Two of his key employees then, Mike Tamburro and Lou Schwechheimer, went on to log decades of service with the club. Tamburro remains the CEO, and Schwechheimer stepped down as vice president following the 2015 season. 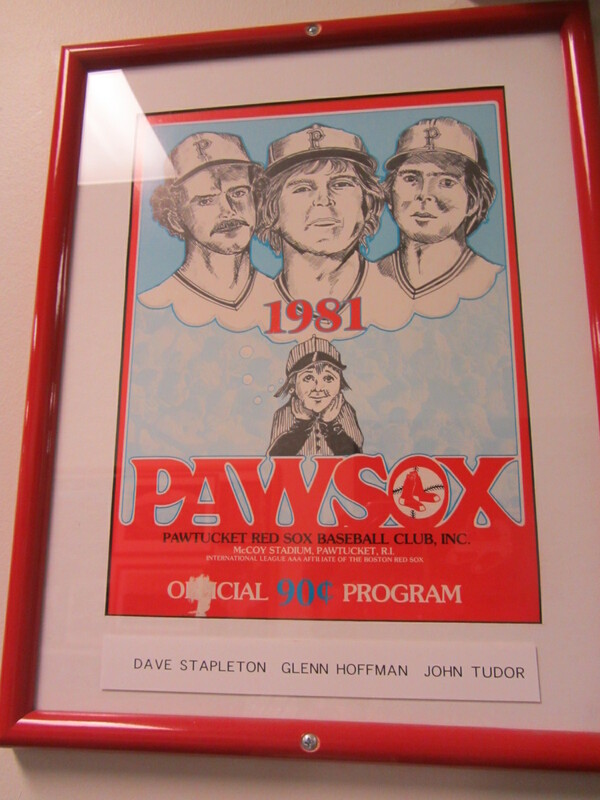 The PawSox, all the way around, have been a model of consistency. They operate in the league’s oldest stadium, boast its longest-running affiliation and have a front office core that has been with the club for decades. But nothing lasts forever. Mondor died in 2010 at the age of 85, and this past February his widow, Madeline, sold the team to a Boston Red Sox-affiliated ownership group which immediately announced its intent to move the team to the neighboring city of Providence. To say that this relocation plan has been controversial would be an understatement. Emotions have run high from the start, and everybody in Rhode Island seems to have an opinion. And, usually, it’s been a negative opinion. The PawSox relocation controversy was front page news on the day that I visited. This machine was situated just down the street from the stadium. 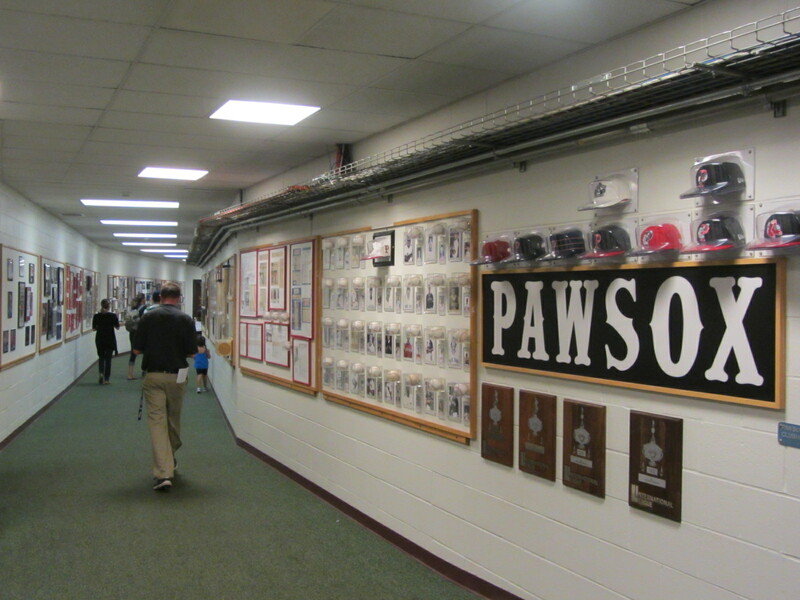 I’ve written plenty about the PawSox in recent months, including articles (HERE and HERE) that originated during this visit. For a fairly up-to-date recap of the situation, click HERE. 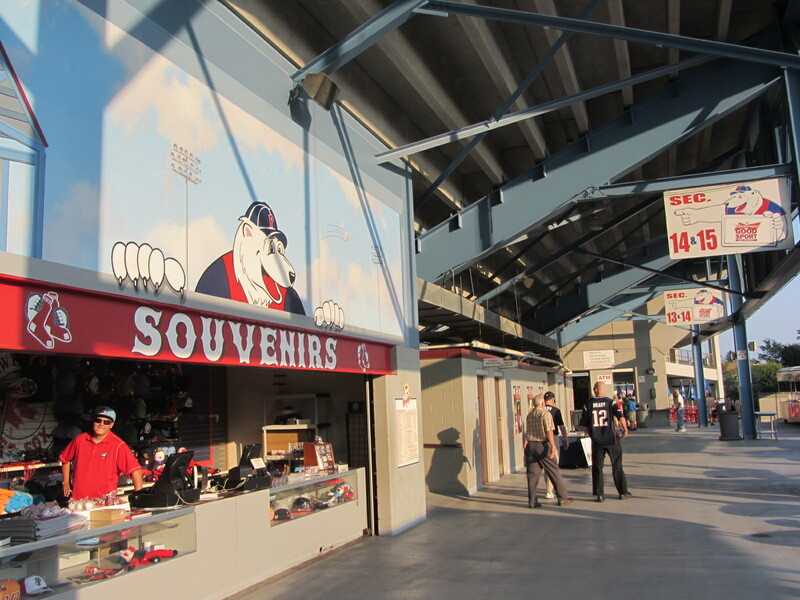 To sum it all up: The Paw Sox will be playing AT LEAST two more seasons at McCoy Stadium, and probably more than that (the current lease expires in 2020). 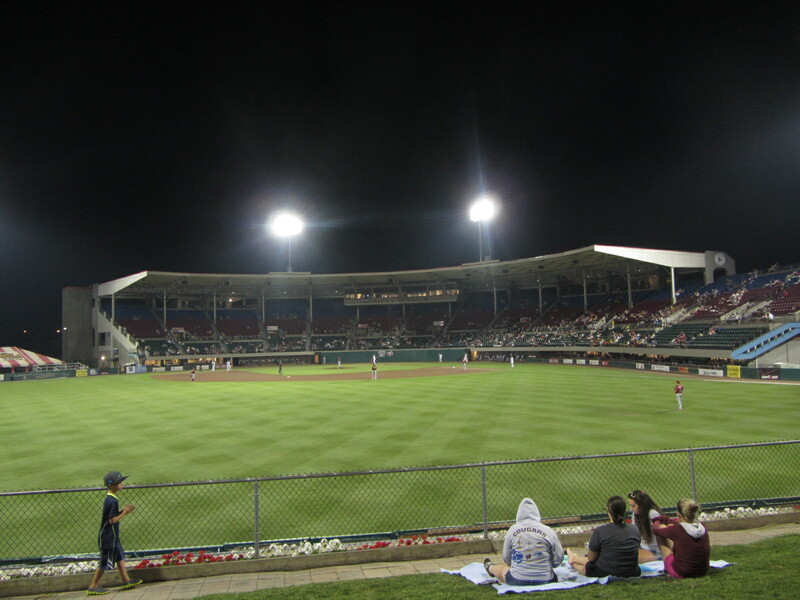 This post and those that follow will simply focus on what it is like to attend a game at McCoy. That’s where I was on this low-key Tuesday evening, and that’s where they’ll be for the foreseeable future. McCoy is located in a scruffy, largely residential area. 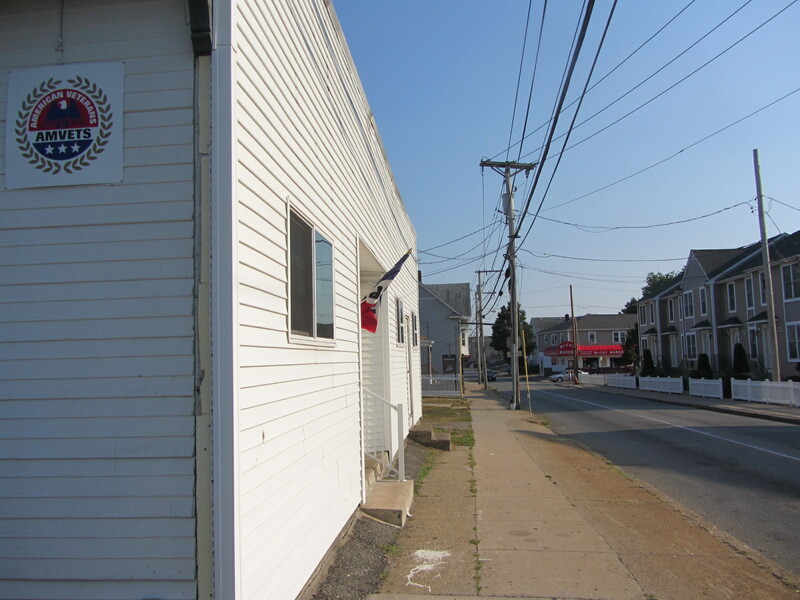 AMVETS Post 13 is located just down the street. 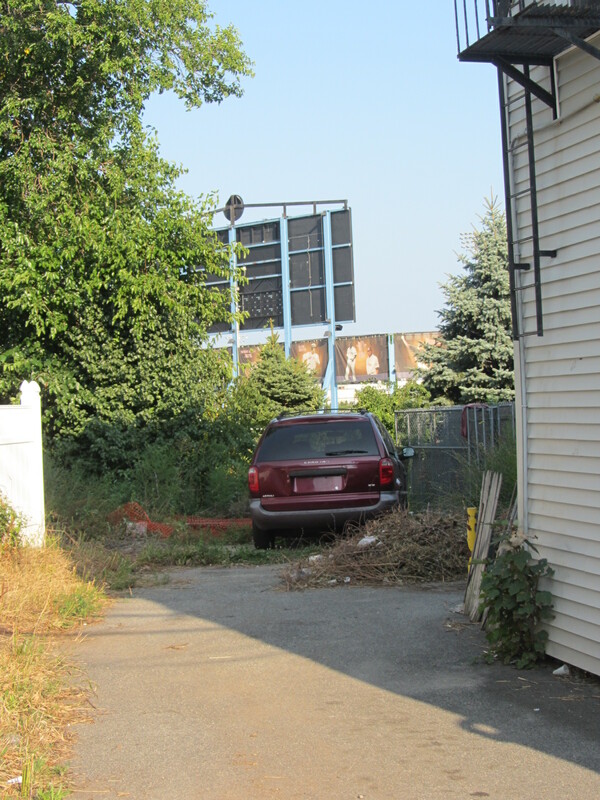 This nearby driveway appears to lead directly into the back of the outfield fence. The Right Spot Diner, probably the most visible and best-known business in the immediate vicinity of the stadium, serves three meals and day and specializes in “Hot Wieners.” This is a Rhode Island-specific form of hot dog, which, according to Wikipedia, are also sometimes referred to as “Gaggers.” I went in before the game, sat on the counter, and got a hamburger steak with green beans. It just seemed like the right thing to do. Moving toward the stadium proper, I was greeted not by a hot wiener but by a cool bear. The bear’s name is Paws. McCoy Stadium is, in a word, venerable. 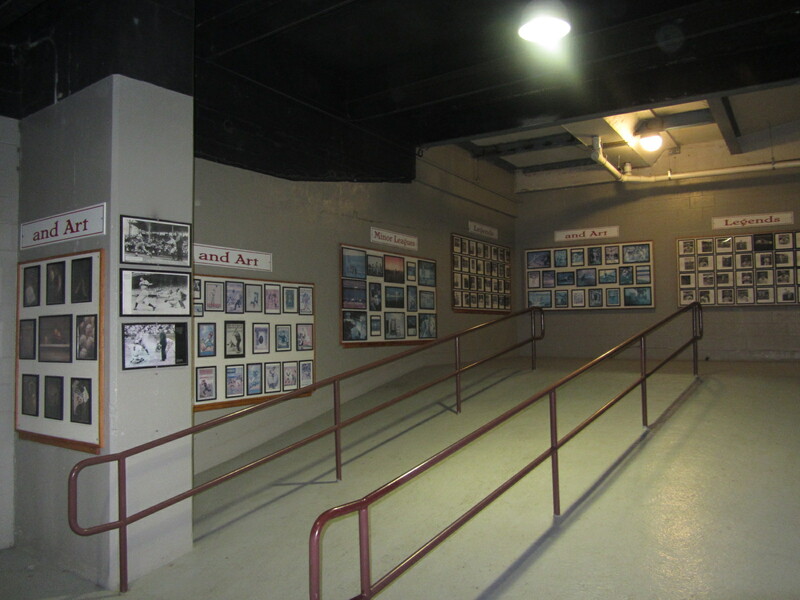 There is a lot of history here, and much of this history is commemorated within the facility’s hallways, stairways, offices and ramps. I would bet that, taken together, no stadium in Minor League Baseball contains more team-specific memorabilia than does McCoy. McCoy’s main entrance is located out toward left field, so one of my first views of the playing field proper came from this vantage point. This is a stadium that immediately felt unique. 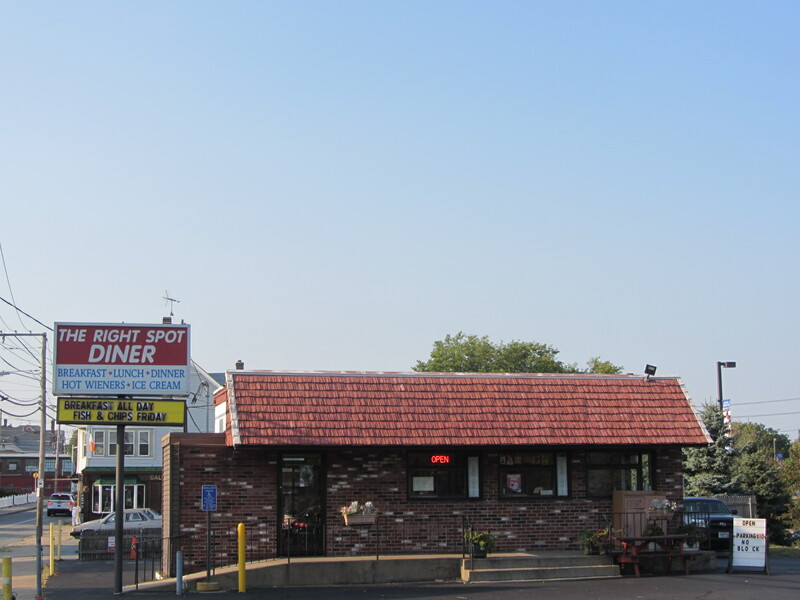 Even after an extensive renovation (in 1999), there is nothing cookie-cutter about it. Souvenirs are available on the concourse. Many, many souvenirs. There is even an “autograph fishing set,” which, if you don’t already know, will make a lot more sense later in the post. On the concourse, one finds an extensive homage to McCoy’s biggest claim to fame. 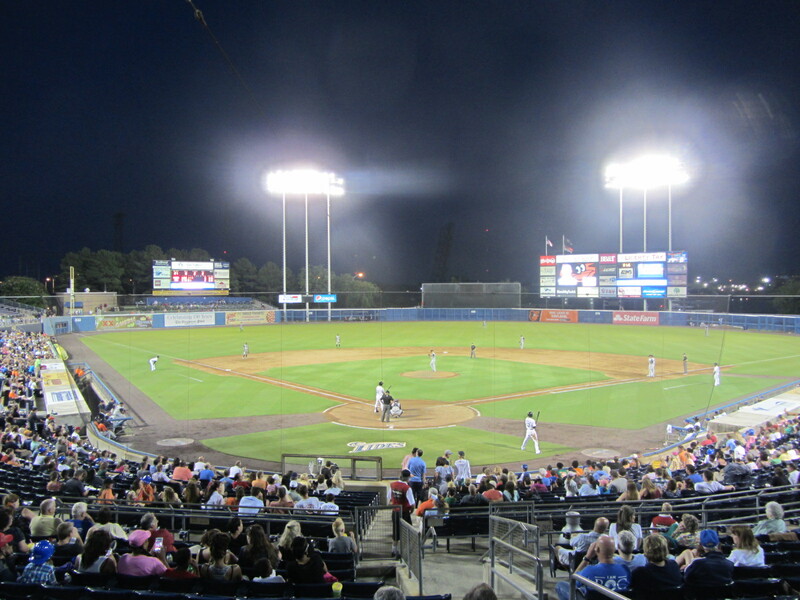 In 1981, the stadium hosted the longest professional baseball game of all time. 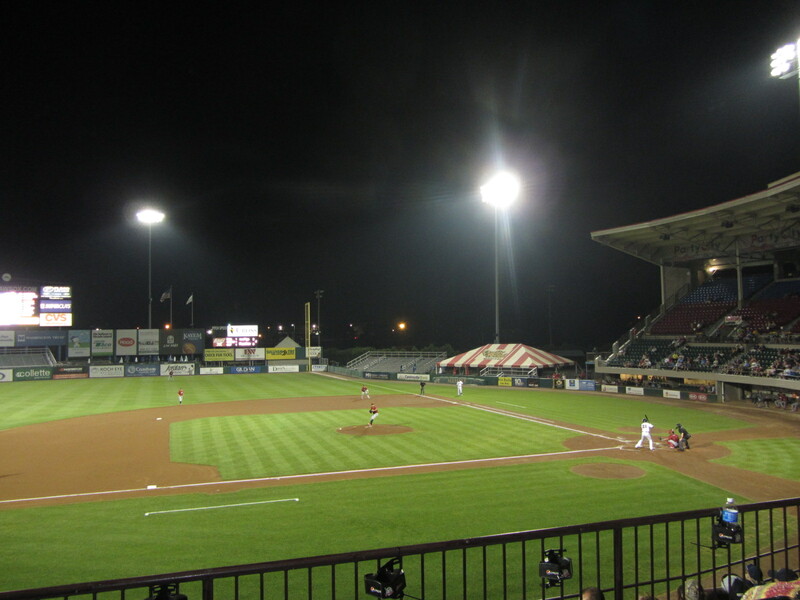 The game, between the PawSox and Rochester Red Wings, took 33 innings to complete. 32 of these frames were played on April 18 and 19th. 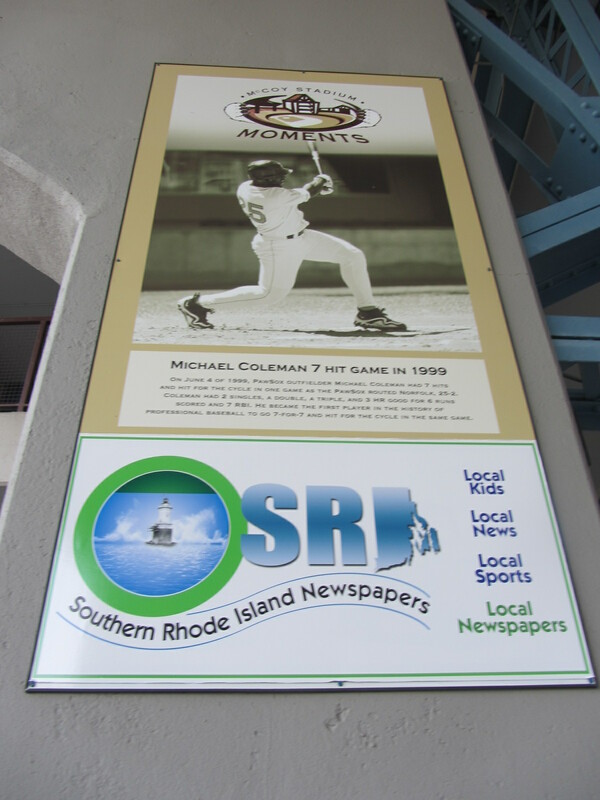 Another great “McCoy Stadium Moment” occurred in 1999, when Paw Sox outfielder Michael Coleman went 7-for-7 and hit for the cycle in a 25-2 rout of Norfolk. As this sign notes, Coleman “became the first player in the history of professional baseball to go 7-for-7 and hit for the cycle in the same game.” Coleman played 22 games over part of three Major League seasons (1997, 1999, 2001) and didn’t hit for the cycle over the entirety of his MLB career (he collected eight hits, including one double and one home run). Baseball is a rabbit hole. I’m always getting lost. McCoy Stadium is laden with such signifiers of the past. 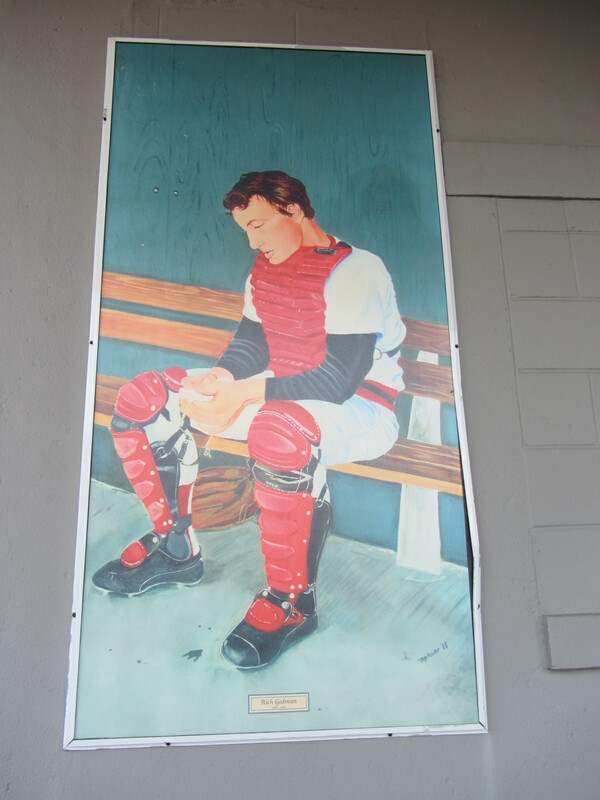 This painting of a sad-looking Rich Gedman, who did play in “The Longest Game, “is located on the ramp leading to the upper level. The view from the top of the ramp. 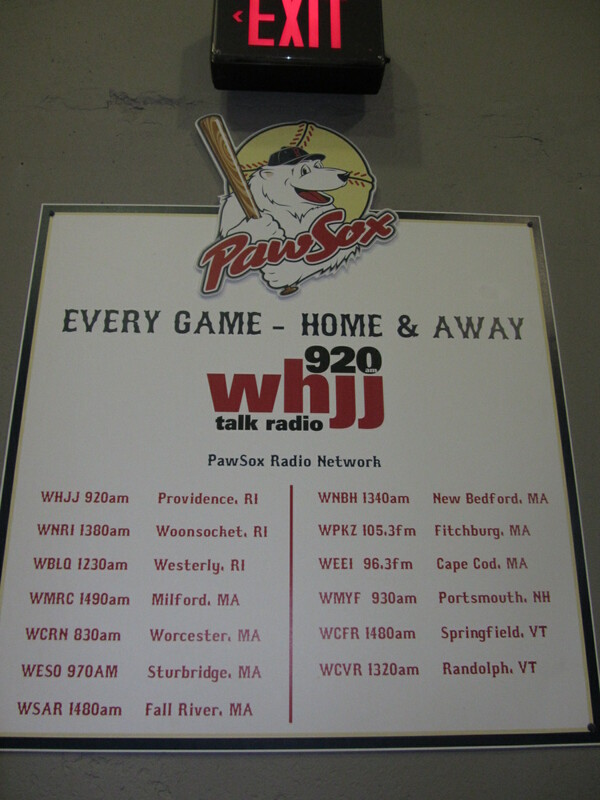 Yep, more Paw Sox-related player signage can be seen from here as well. 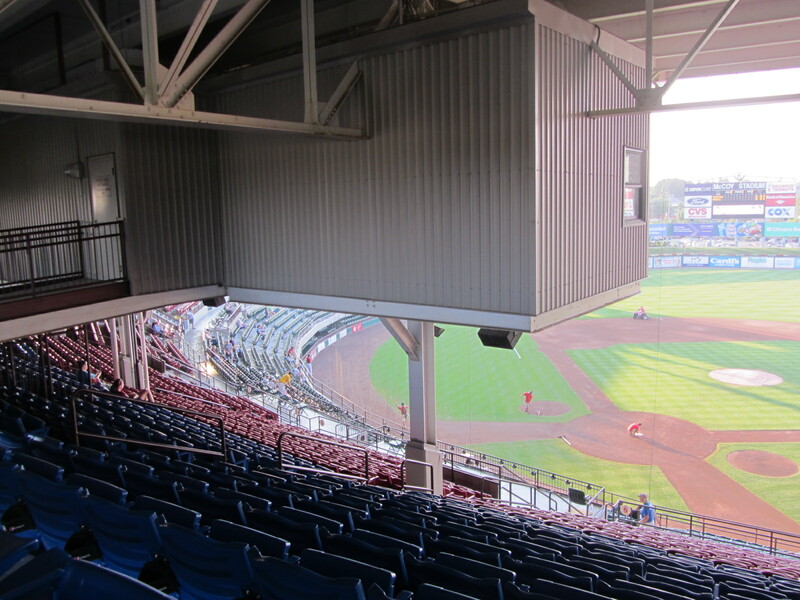 There is a ramp leading from the upper-level aisle into the press box, which looms above and in front of a section of seating. I don’t think that I’d ever seen that before. The McCoy broadcaster’s booth, which in 2014 was occupied by Josh Maurer and Will Flemming, has long been a hotbed of future big league talent. I wrote an article about this phenomenon for MiLB.com last offseason (after PawSox broadcaster Jeff Levering was hired by the Brewers), and that article was reprinted in the Paw Sox’s 2015 yearbook. 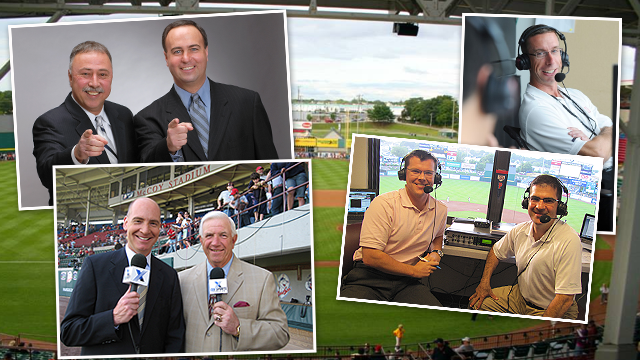 Every Minor League broadcaster wants to eventually get to the big leagues. 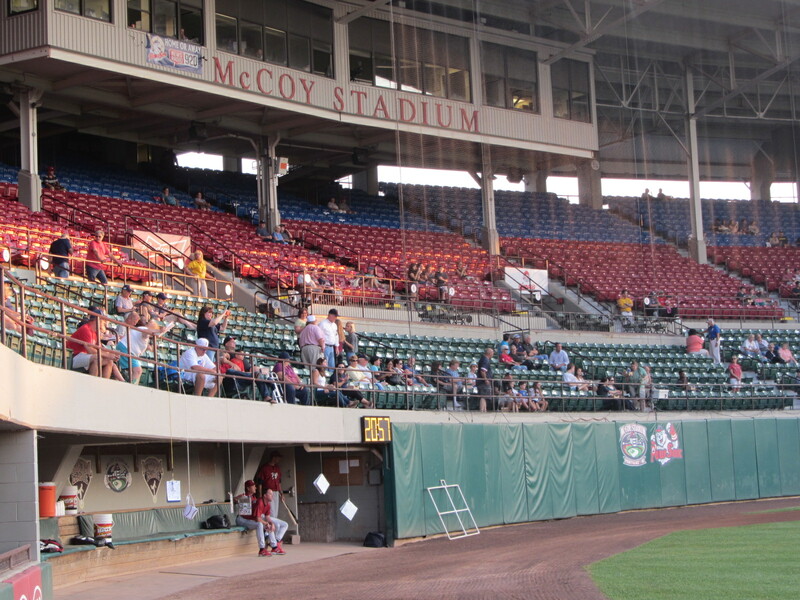 But Pawtucket is a good place to be in the interim, as the listening audience is far bigger than the average team’s. McCoy Stadium also has what is considered to be the best press box spread in Minor League Baseball. Several people told me this, and despite the small sample size I would have to concur. If you work in the Minors, then you know how rare it is to get a healthy, balanced press box meal. What a perk. I was in attendance during a Tuesday night in September, and just like in Lowell the night before I was told that I had picked one of the worst days of the season to visit. I seem to have a knack for doing such a thing. On a busy day, dozens of fishing apparatuses would be hanging from the railing as their owners waited for a bite from the players down below. But, again, this wasn’t a busy day. The fishing occurs at both dugouts. Note that here, on the visitor’s side, most of the hanging items are baseball card albums. Time to reel it in, folks, as the game was about to start. 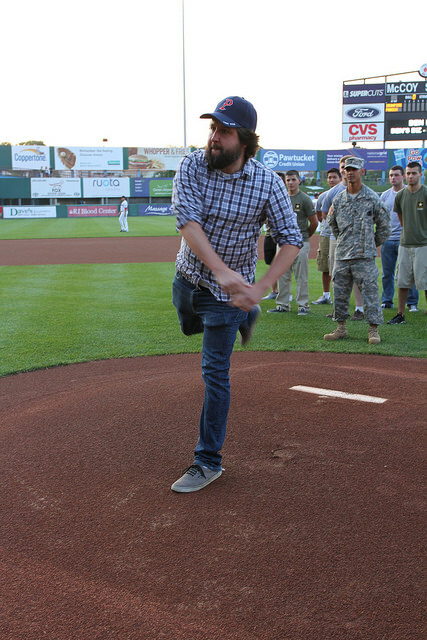 The PawSox, following established (but by no means mandatory) protocol, asked me to throw out a first pitch. 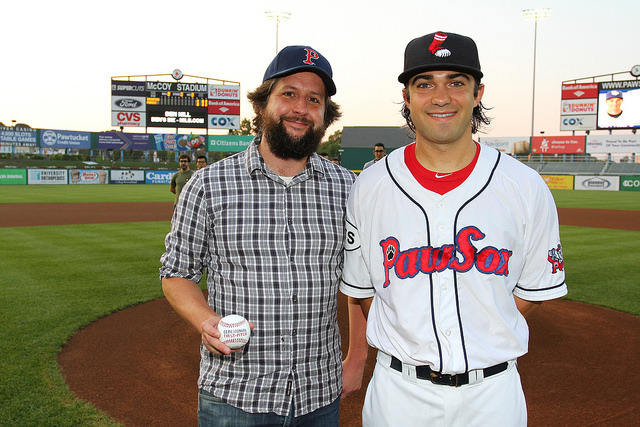 Me, thinking about throwing a perfect strike: Me, throwing a perfect first strike: Me, posing with a PawSox player after throwing out a perfect strike. The Paw Sox do it up right when it comes to first pitches, giving each first pitch thrower a commemorative cap and ball as well as a business card including a link to all of that evening’s pregame photos (which is where I got the three seen above). After throwing out the first pitch, I was directed back into a corridor and, yes. 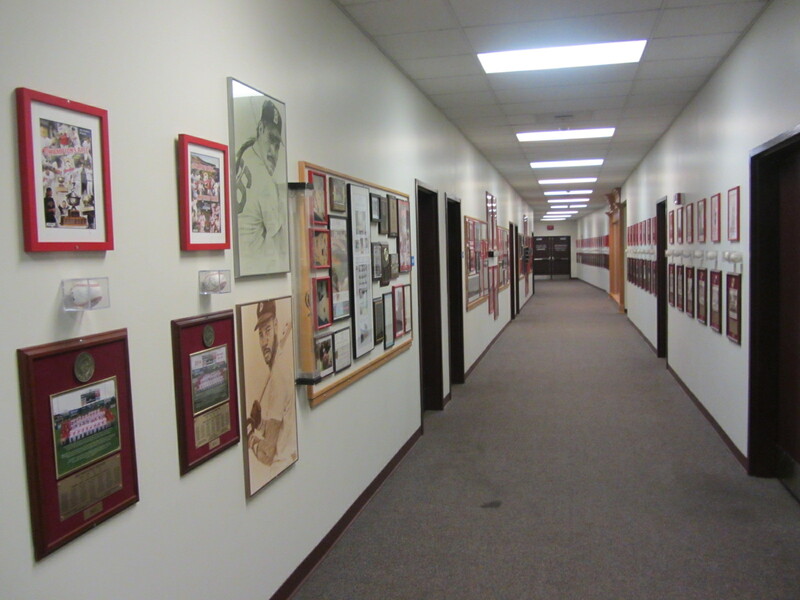 That corridor was packed with memorabilia. 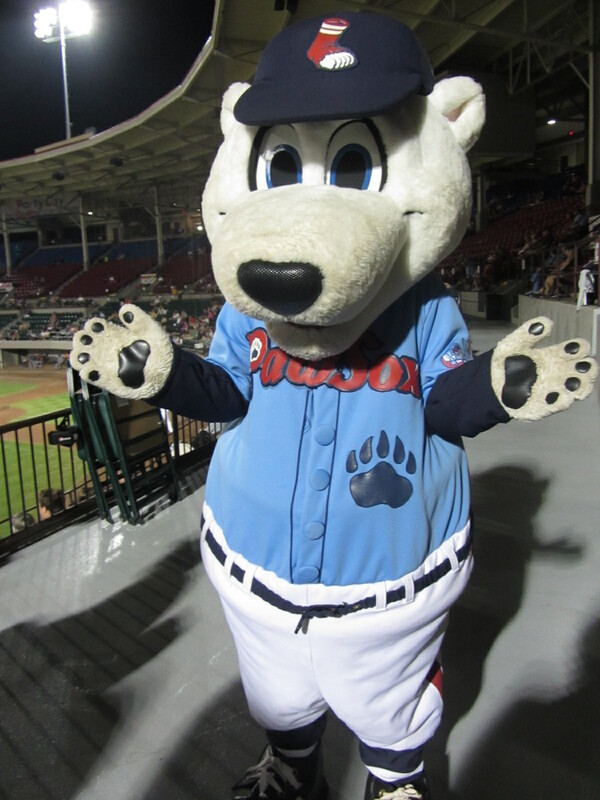 Now is as good a time as any to “Paws” this McCoy Stadium saga. Stay tuned for the exciting conclusion, which will appear as soon as humanly possible. 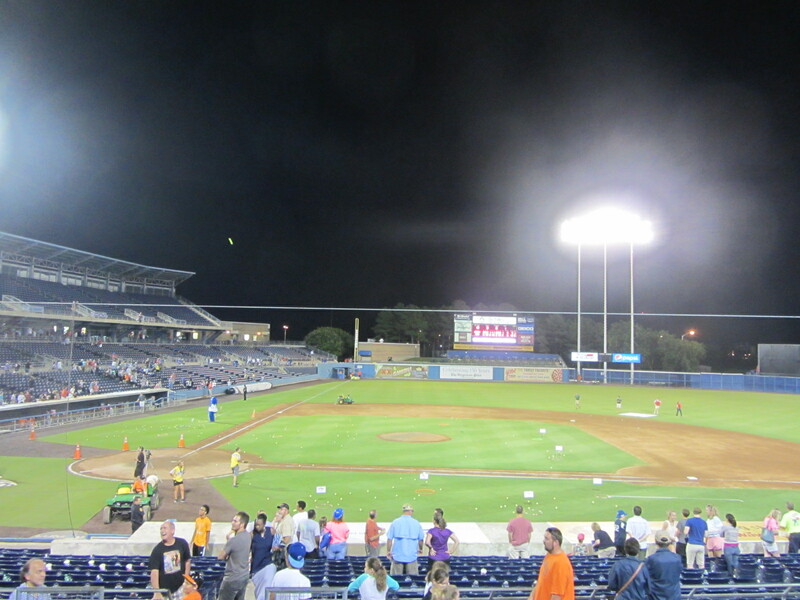 To see all of posts from my June 26, 2015 visit to the Norfolk Tides (this is Part One) click HERE. To see all of the posts from my May 2015 trip through the Virginias, click HERE. To see ALL of my “On the Road” posts (going back to 2010), click HERE. 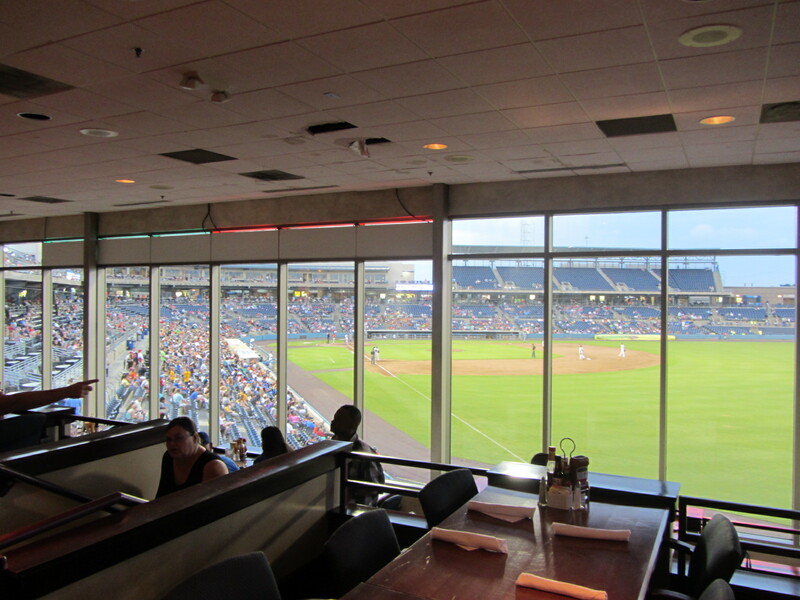 This, here, is the unassuming facade of ballpark restaurant Hits at the Park. 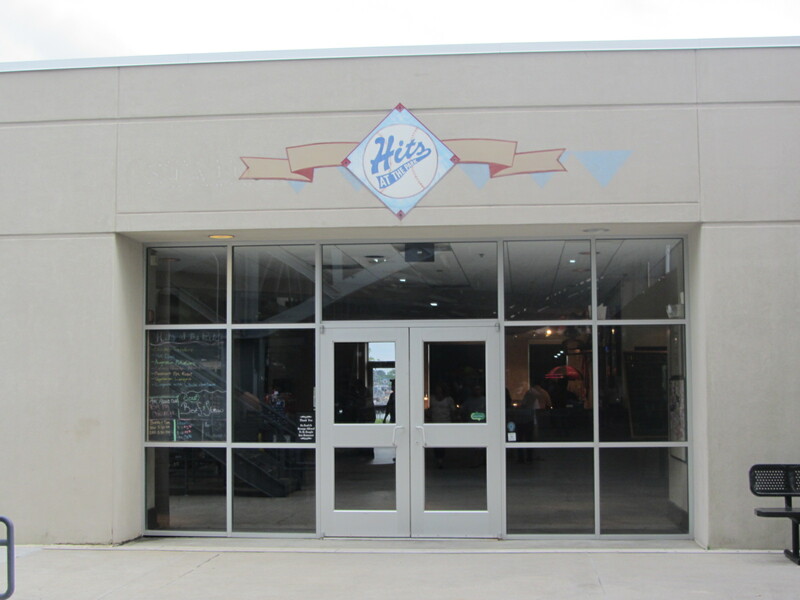 Located far down the right field line at the Norfolk Tides’ home of Harbor Park, Hits at the Park is a full-service eatery open to all fans during all home games. An “all-you-can-eat” dinner buffet, featuring a rotating menu, costs $18.95. That’d be the sensible option when it comes to dining at Hits at the Park. There is also, however, an insensible option: The “Salute to Pork” Challenge. 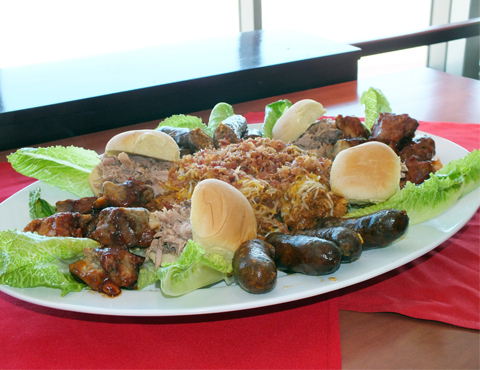 The above platter consists of four BBQ pork sliders, four 4-ounce Cajun-smoked sausages, 12 pork wings (the equivalent of a full rack of ribs) and bacon and chili cheese tots. It’s five pounds of food altogether, and the challenge is to eat it in one hour or less. Those who do so receive the meal for free (a $60 value), as well as a celebratory “I Kicked the Big Pig” t-shirt and four tickets to an upcoming ballgame. 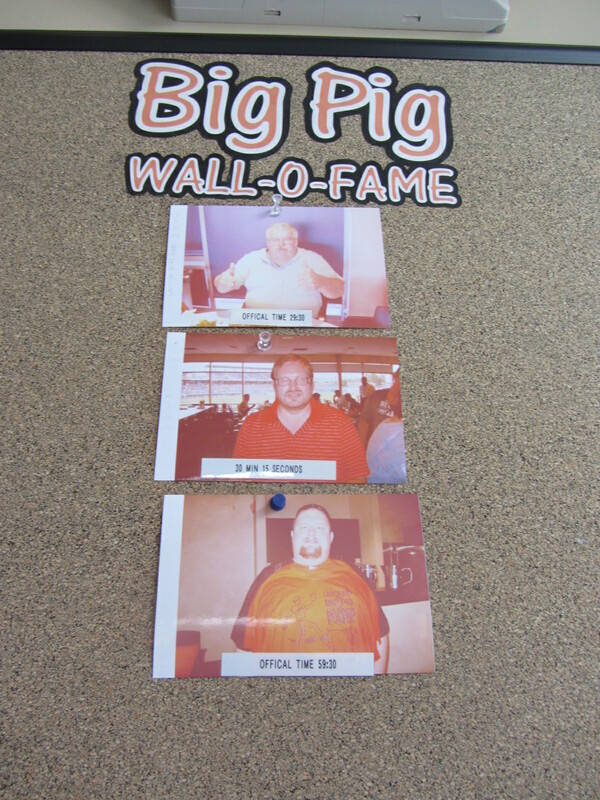 Most importantly, successful pork-eaters attain enshrinement on the “Big Pig Wall-O-Fame” (located just inside the restaurant entrance). Only three individuals have ever completed the challenge successfully. Yep, that dude on the bottom completed the challenge with just 30 seconds to spare. That must have been one of the greatest moments in Hits at the Park history. 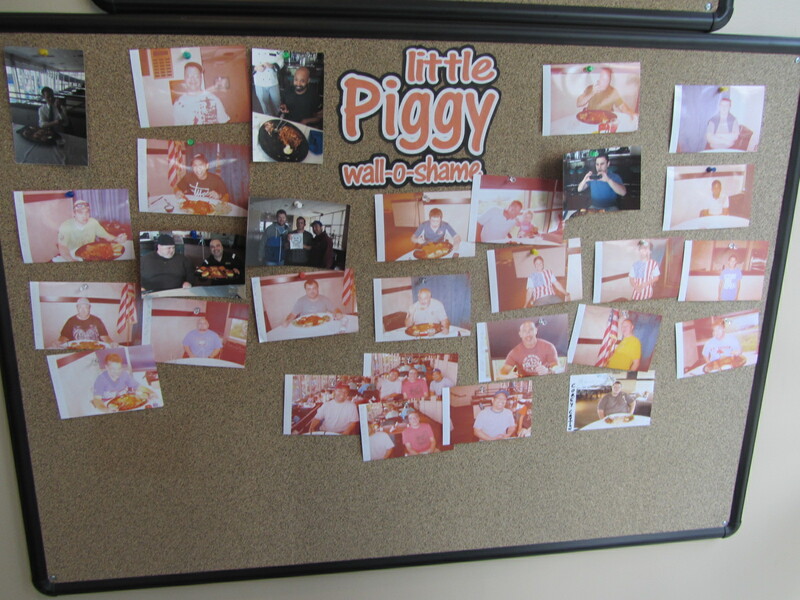 The “Little Piggy Wall-O-Shame” has far more occupants. Whereas three have succeeded, several dozen had failed. “He’s never been a good influence on my life,” said Andrew, of Josh. 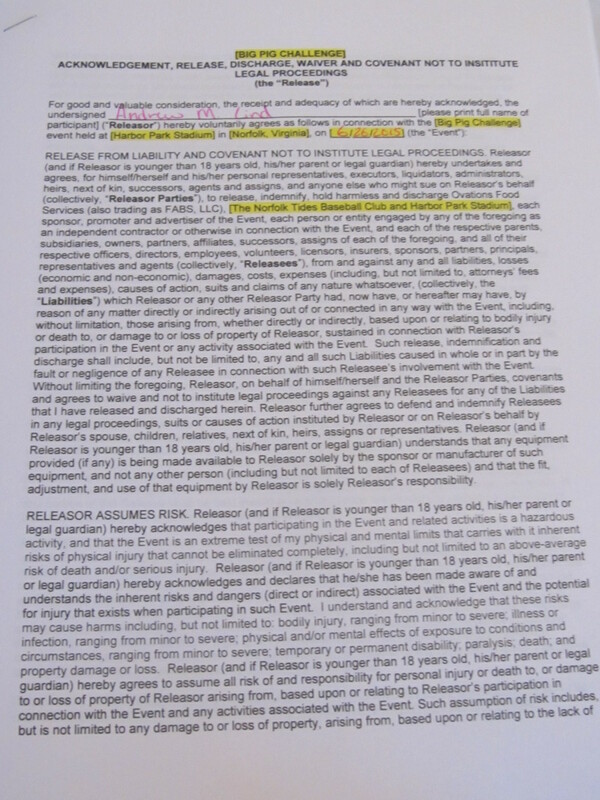 A good rule of thumb: If signing a waiver is a meal prerequisite, then it’s probably a meal you don’t want to have in the first place. But Andrew was up for it, regardless. 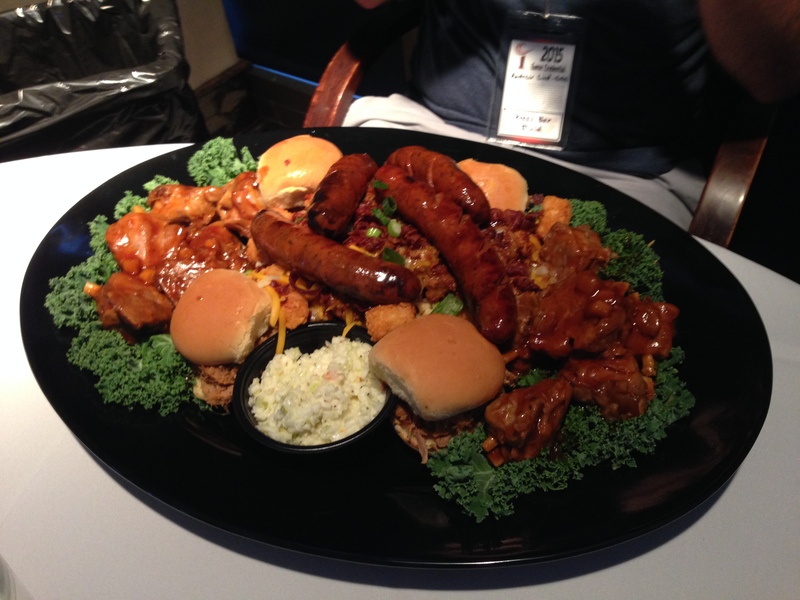 He said that he hadn’t made any specific preparations for the Salute to Pork Challenge, other than to arrive at the ballpark on an empty stomach. His strategy was simply to “put the tater tots off for last” and to not touch the coleslaw. Tyler’s late entry into that evening’s Salute to Pork Challenge was, quite frankly, the most baffling moment of the season for me. He just plopped down and took a seat, and since he had media pass I assumed he was one of Andrew’s Tidewater News cronies. Andrew, meanwhile, thought he was somebody I knew. 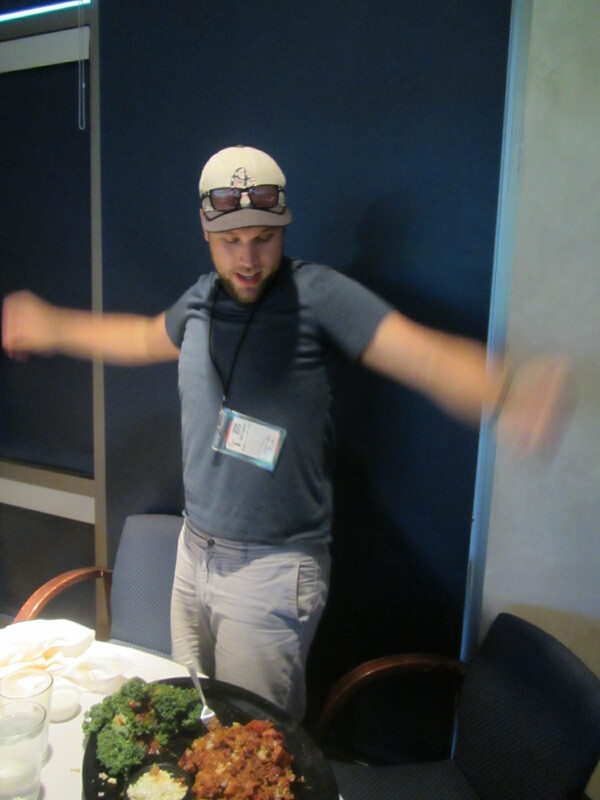 After a few awkward moments, it was revealed that Tyler didn’t know either of us and had simply decided to participate after overhearing a conversation about it in the press box. Well, okay. The more the merrier. 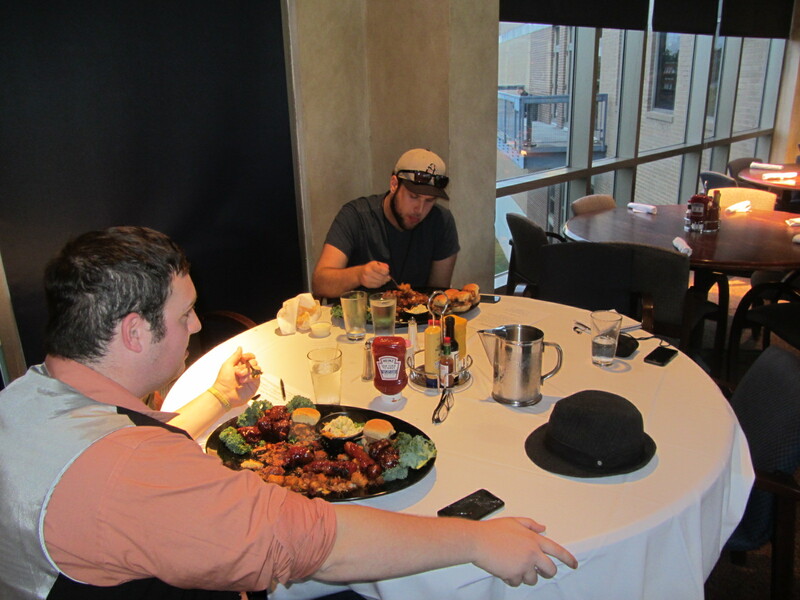 The Pork Challenge platters were brought to our dimly-lit corner location with great fanfare. 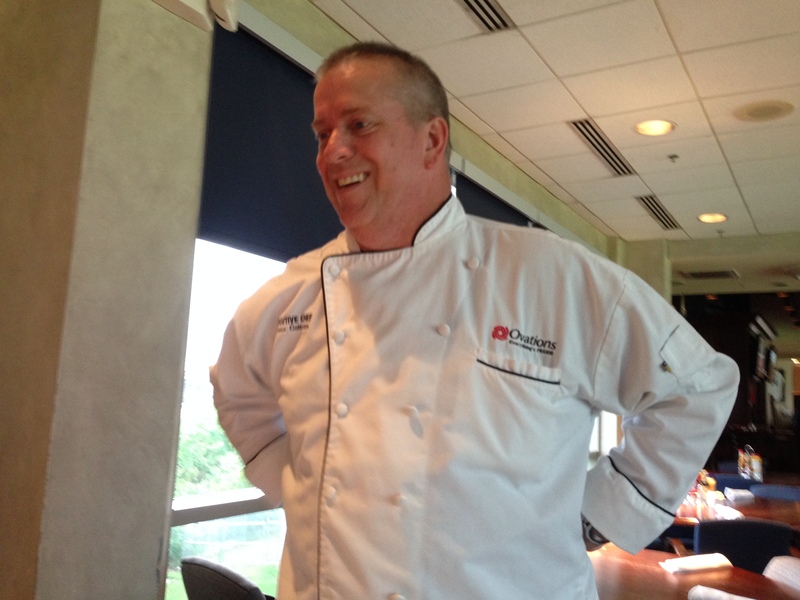 In the below video, executive chef Steve Gillette, the mastermind behind the challenge, takes the mic and lays out the rules for everyone in the restaurant. This surreal situation now seemed even more surreal. Tyler isn’t even sitting at the table in the video. Was he a figment of my imagination? He sure seemed like it at the time. Chef Gillette was expecting this to be an entertaining disaster. You can just see it in his eyes. Andrew, meanwhile, seemed to be appealing to a higher power. I’d love to see this picture turned into a stained glass panel. 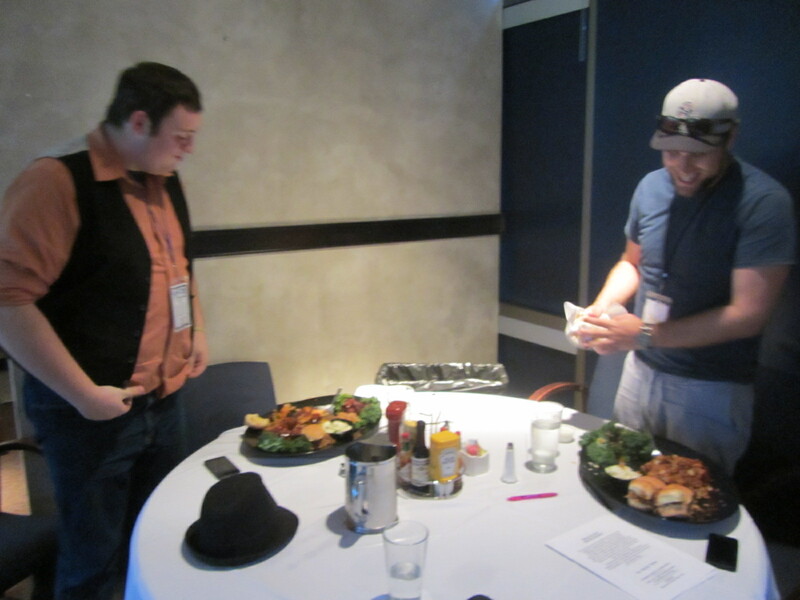 The Pork Challenge officially began at 7:42 p.m. Alright, guys. Have at it. Now underway, Andrew displayed a momentary burst of confidence. “The sad thing is, after all this I’ll probably go home and want a snack,” he said. 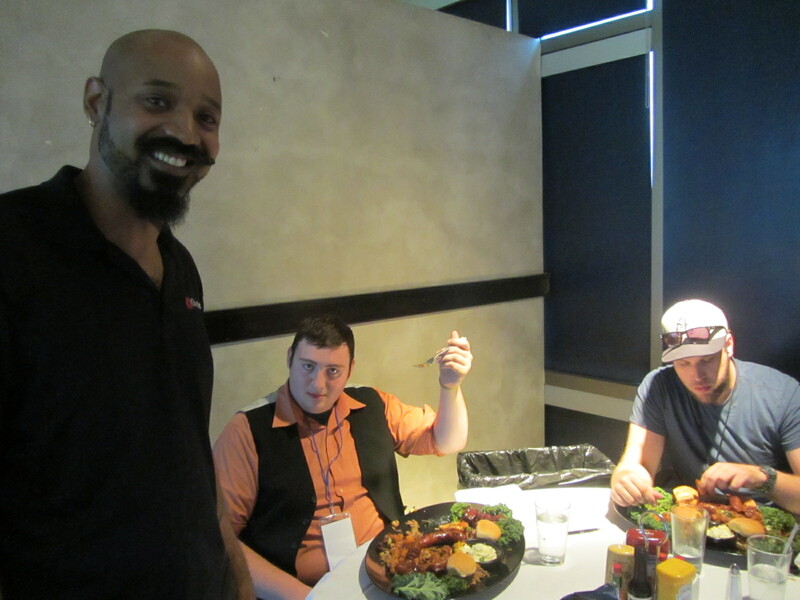 Cory Evans of Ovations Food Services, seen on the left in the below photo, was the first person to attempt the “Salute to Pork Challenge” after it was devised by Chef Gillette. “It’s the potatoes that get you,” added a nearby waitress, speaking in an emphatic Southern drawl. But despite such helpful hints and overall moral support, this was a fundamentally lonely endeavor. It is times like these that try men’s souls. The game going on outside seemed a million miles away. At 8 p.m., Andrew requested ranch dressing. “It might be heavy, but it will give flavor when you need it,” he explained. 12 minutes later, Andrew again chimed in. We had now reached the half-way point. Andrew’s platter had congealed into a monolithic pork mess. Both competitors, in it for the long haul, decided to stand up and stretch. “This would be a good challenge for a stoner,” added Cory. Good advice, but before re-engaging Andrew engaged in some light calisthenics. Gotta get the blood flowing. 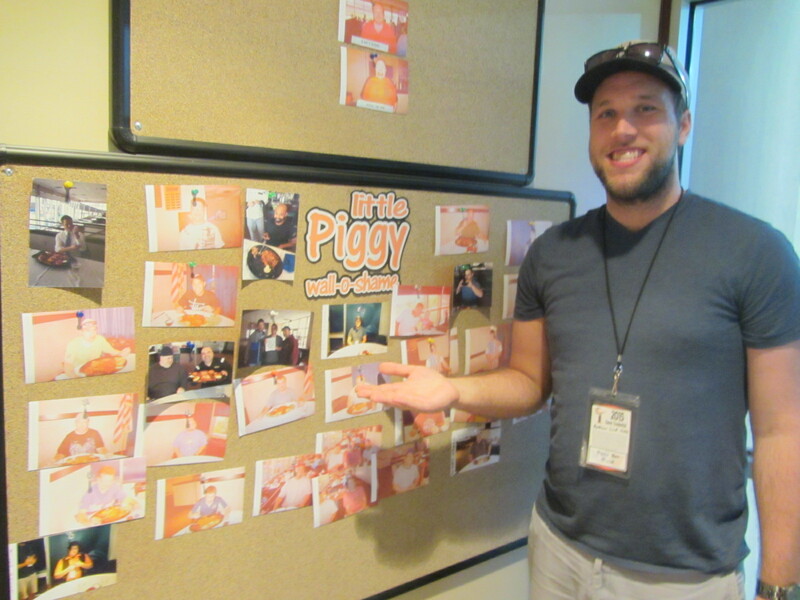 Cory, a Pork Challenge veteran, now assessed the scene. “You’re looking pretty good for the halfway point,” he said of Tyler. Andrew, however, was a different story. If you don’t want anyone to take a picture of you vomiting, then don’t jump unannounced into an eating challenge taking place in a public location and, furthermore, being documented in detail by a member of the media. “I think it was the sausage that got me,” he said. 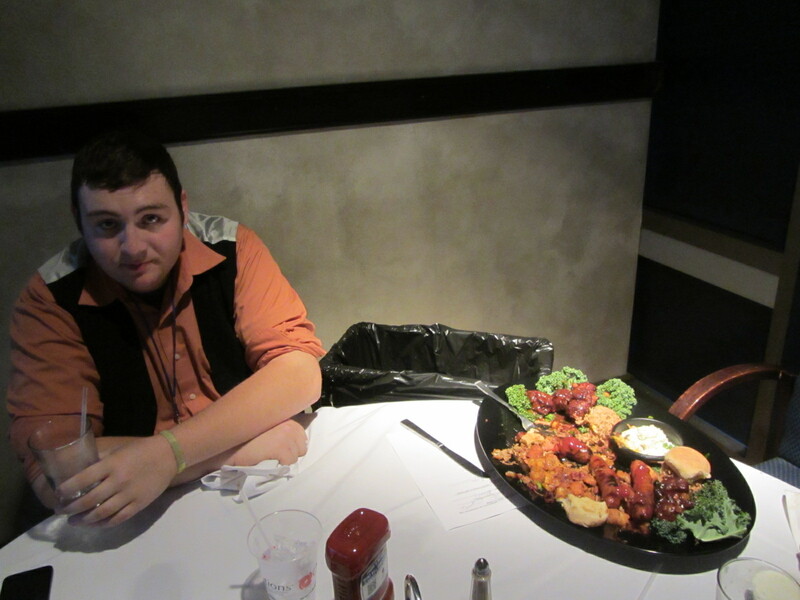 This was all too much for Andrew, who immediately got up and moved to the next table lest he be the next to evacuate. We were now in the homestretch. 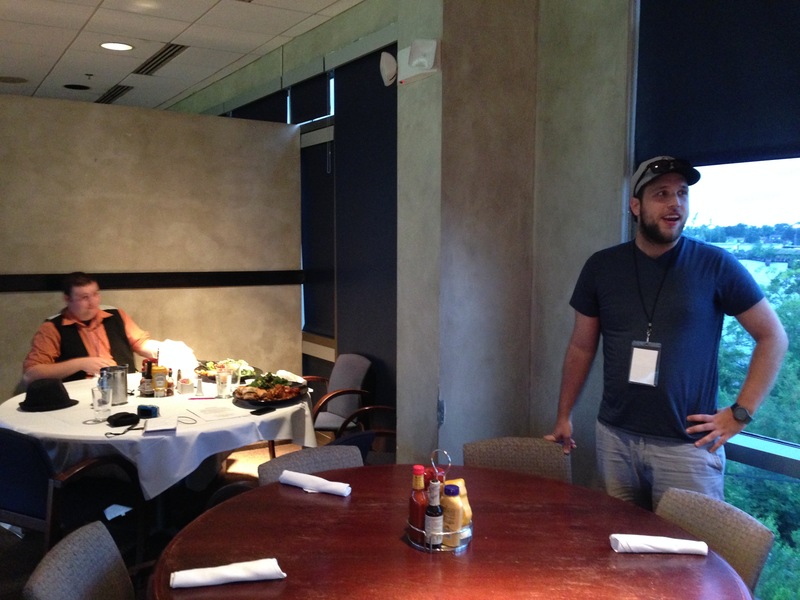 Tyler, ever an enigma, declined to take his leftovers and quietly went back upstairs to resume working. Once again, I found myself wondering if he had ever been there at all. 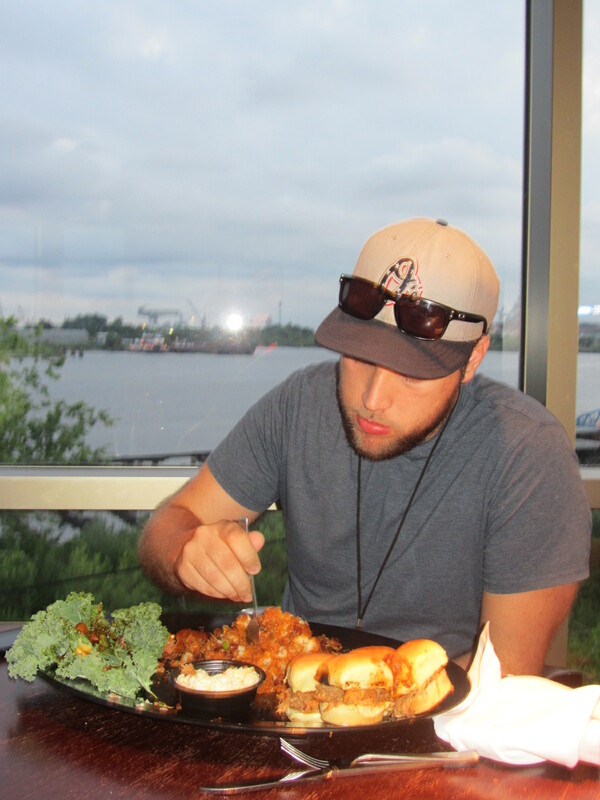 “He don’t want no memories of that,” said a Hits at the Park waitress as she removed the remains of Tyler’s plate. Andrew, meanwhile, had hit a wall. It was all for naught, however. 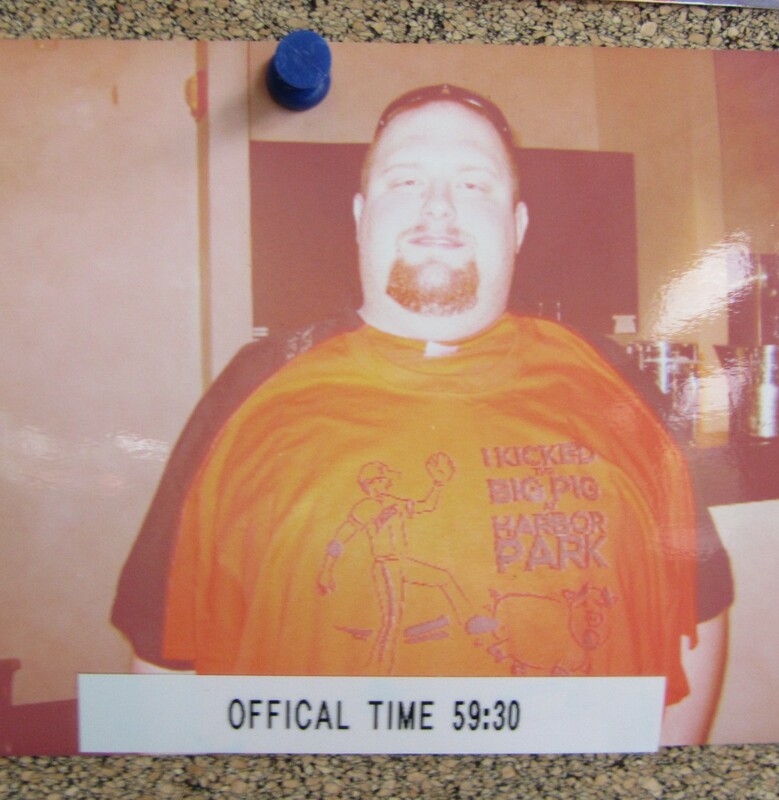 Andrew simply could not finish in time. Good effort, though, as he made it about three quarters of the way through and had some pork sliders to take home and enjoy later. And congratulations as well to the mysterious Tyler Rosso. You made the night more interesting, Tyler, and I’m glad you stopped by. 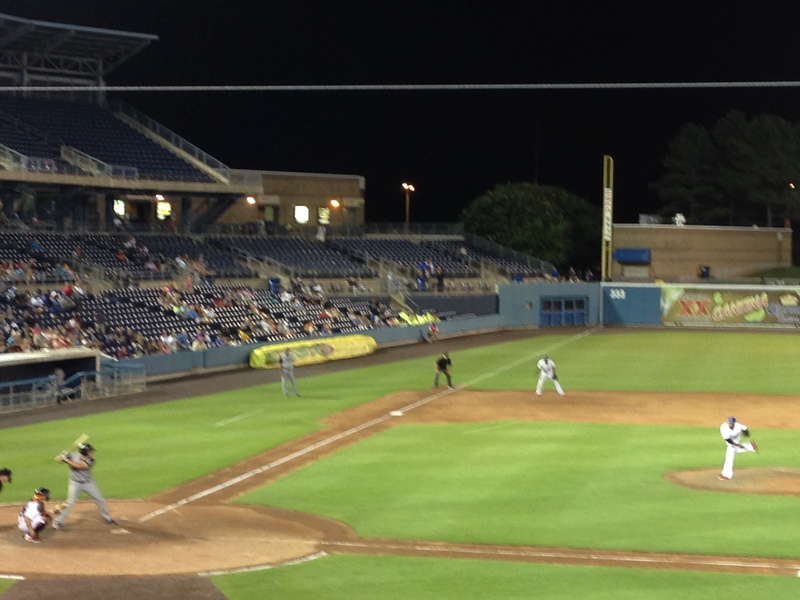 To see all of posts from my June 27, 2015 visit to the Norfolk Tides (this is Part Two) click HERE. To see all of the posts from my May 2015 trip through the Virginias, click HERE. To see ALL of my “On the Road” posts (going back to 2010), click HERE. 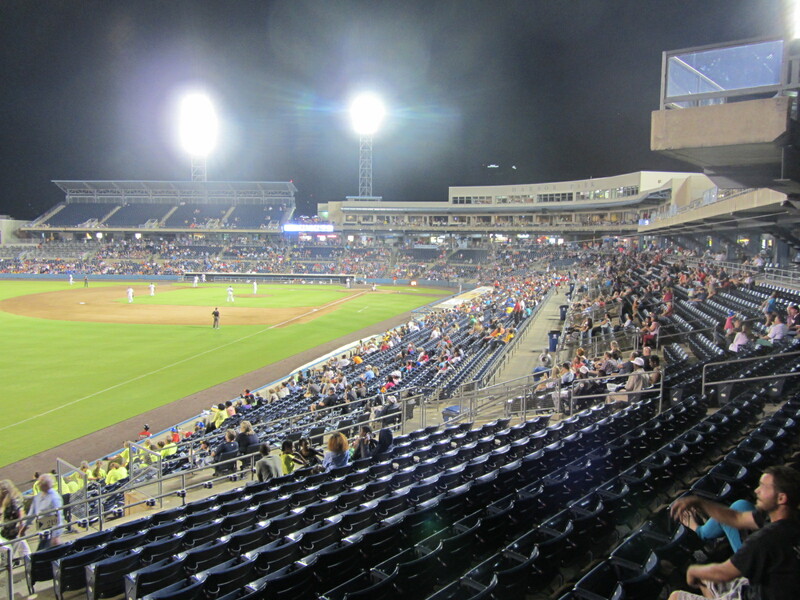 So what does Norfolk’s Harbor Park look like on a Friday evening in late June? I’m not going to tell you, I’m going to show you. Telling you would take descriptive writing skills that, quite frankly, I don’t have. 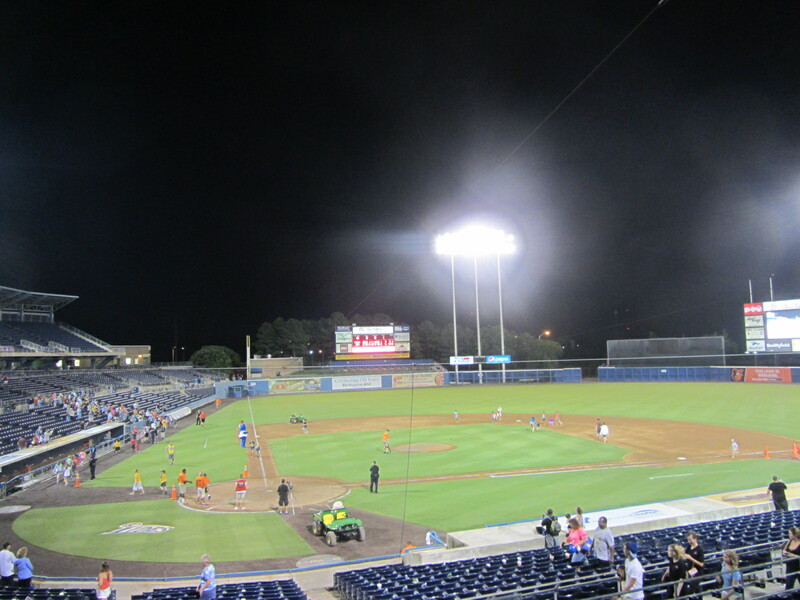 Then above photo depicts the Harbor Park scene on Friday, June 26th, sometime during the middle innings. Truthfully, I didn’t have much to do at this juncture of the evening. 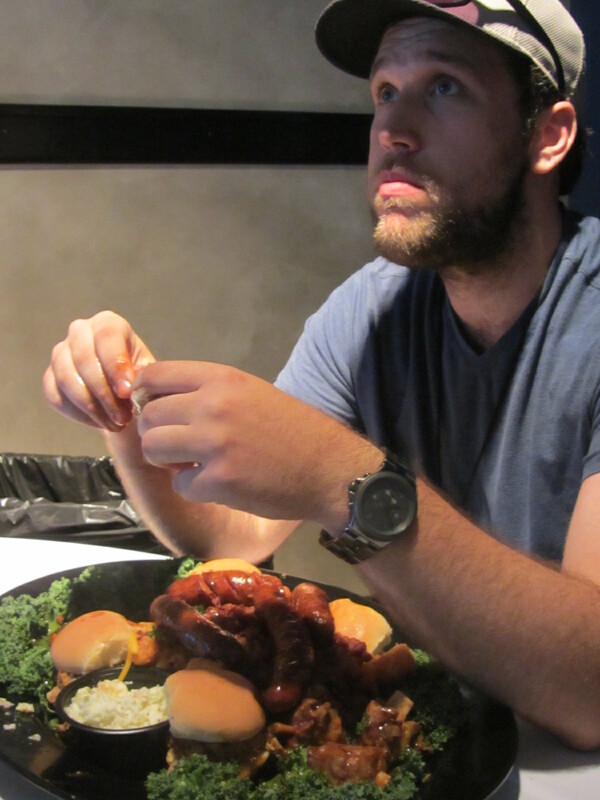 My interview with Dave Rosenfield had lasted until sometime in the second inning, at which point I hightailed it down to the “Hits at the Park” restaurant in order to document my designated eater attempt the “Pork Challenge.” This will be documented in the next post. I feel uncomfortable when I don’t have much to write about, but here we are. Um…here’s an alternate view of the nighttime action. Pretty big stadium, huh? 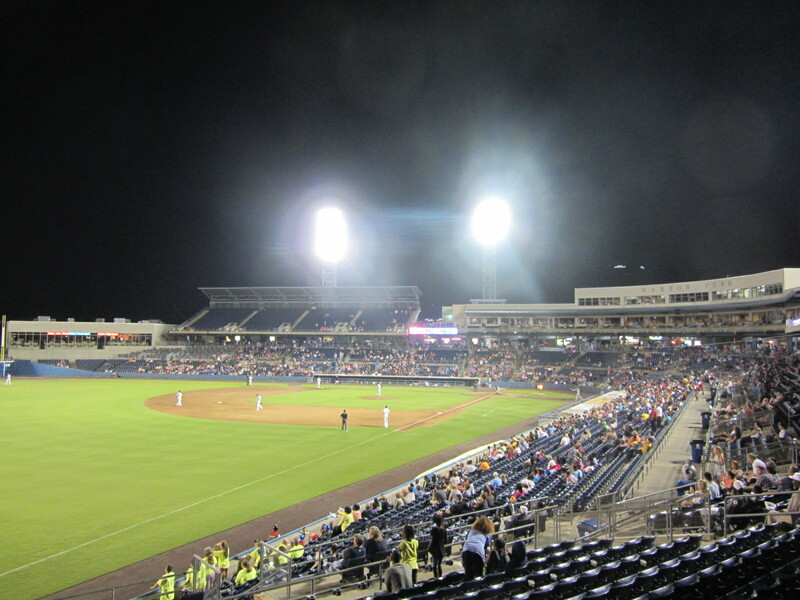 As mentioned in the last post, Harbor Park has a capacity of nearly 12,000. 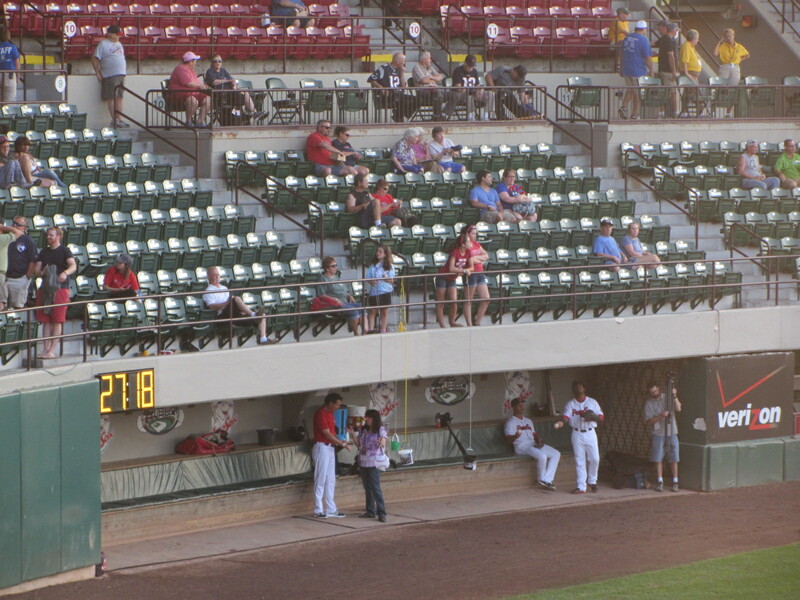 The announced crowd for this contest against the Mud Hens of Toledo was 5,069, slightly below the team’s 5200 average (weird, as, again, this was a Friday night. A bunch of people probably got stuck in Hampton Roads Bridge Tunnel traffic and gave up on going to the game). During my unfocused wanderings, I ran into mascot Rip Tide. 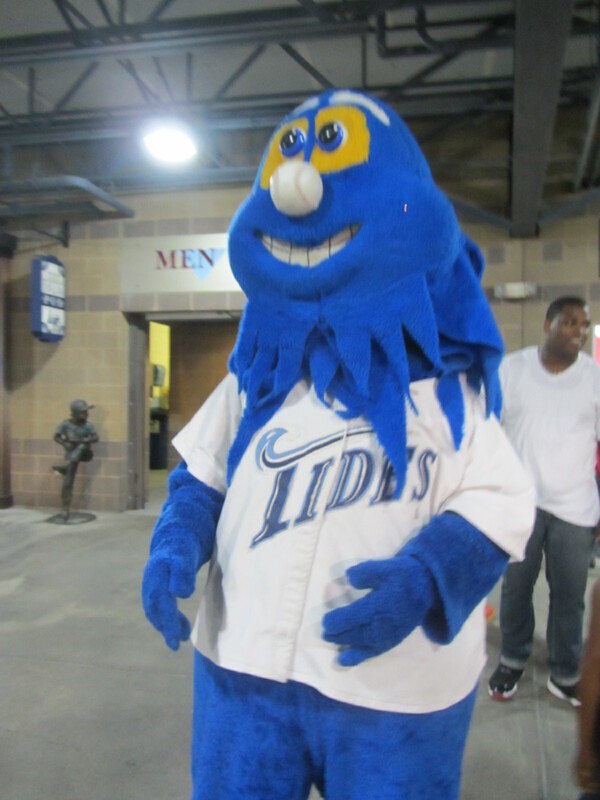 Mascots are strange, by default, but I posit that Rip Tide is strange even by mascot standards. I’ve heard of a bulbous nose, but I’d never before seen a basebulbous nose. It doesn’t make scents to me. As for what Rip Tide is, I don’t know. He’s vaguely aquatic. Perhaps his unfamiliarity with dry land is what led to this infamous 2012 blooper, an absolute classic by any standard. Rip Tide wasn’t the only costumed character lurking about. That’s Reggy the Purple Party Dude, a touring entertainer who may or may not have a large order of fries emerging from his skull. This photo was taken shortly after Reggy delivered a cake to an usher who was celebrating his birthday. Thing is, Reggy tripped and ended up smashing the cake into this guy’s face instead. 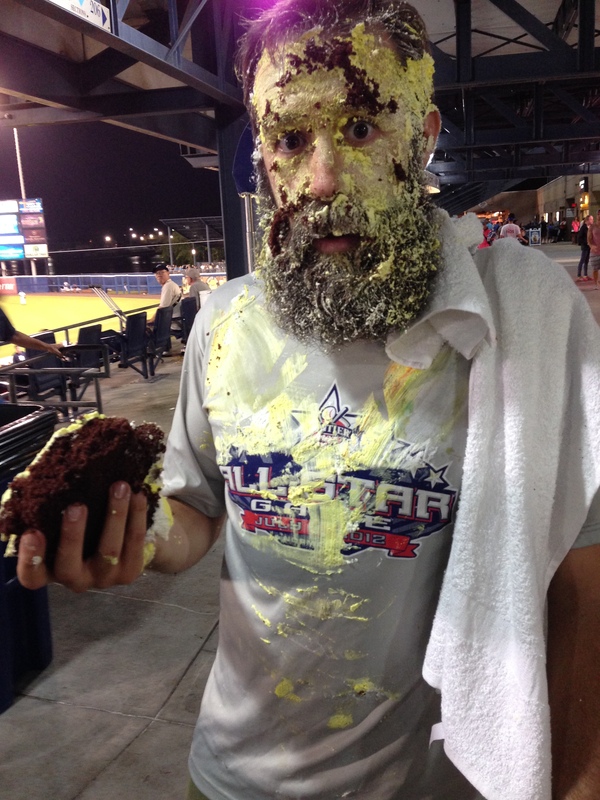 Being the enterprising journalist I am, a modern-day Damon Runyon by any standard, I landed an exclusive interview with the dude who got smashed in the face with a cake. Truth be told, because it’s not gonna tell itself: the dude who got caked is Christopher Bruce, who usually performs as Reggy. His recent leg injury, referenced in the below video, has relegated him to bit player status in his own act. But — hey! — the show must go on. Reggy stops for no dude. As Reggy signed autographs for his fans, I decided that it would be a good time to actually pay attention to the ballgame. Or, at the very least, make a painfully obvious joke about it. The game stayed tied through the ninth, so extra innings it would be. This picture, taken in the top of the 10th inning, is not of a very good quality. But it is notable, at least to me, in that Toledo’s Mike Hessman was up to bat. Hessman popped out in this 10th-inning at-bat, but the Mud Hens had taken a 4-3 lead thanks to Jefry Marte’s home run to lead off the frame. The Tides did not go quietly in the bottom of the 10th, however. Rey Navarro singled to start the inning and then scored on Christian Walker’s double. After Derrik Gibson popped out on a bunt attempt, Steve Clevenger was walked intentionally. (Pantera’s “Walk” was his musical accompaniment as he made his way to first base.) Sean Halton then drew an unintentional walk to load the bases, bringing up Michael Almanzar with a chance to win the game. He did. That was my recollection, at least. In the game log, it says that Almanzar grounded into a 6-5 force out as Walker came around to score the winning run. This makes no sense to me. One, I don’t remember seeing the shortstop throw to third base. Why throw to third in that situation? There was no shot at a double play, and a force out at third base was as good as a hit as far as the Tides were concerned. Something’s fishy here, which I guess is a common occurrence when your stadium is on the banks of a river. It was then time for Launch-A-Ball, everyone’s favorite skill-based post-game tennis ball-tossing endeavor. Wow, my notebook is a great source of information! I should look at it more often. Kids then ran the bases as Ozzy Osbourne’s “Mama I’m Coming Home” played over the PA. Nice choice, guys. It was now 10:30 p.m. Do you know where your children are? 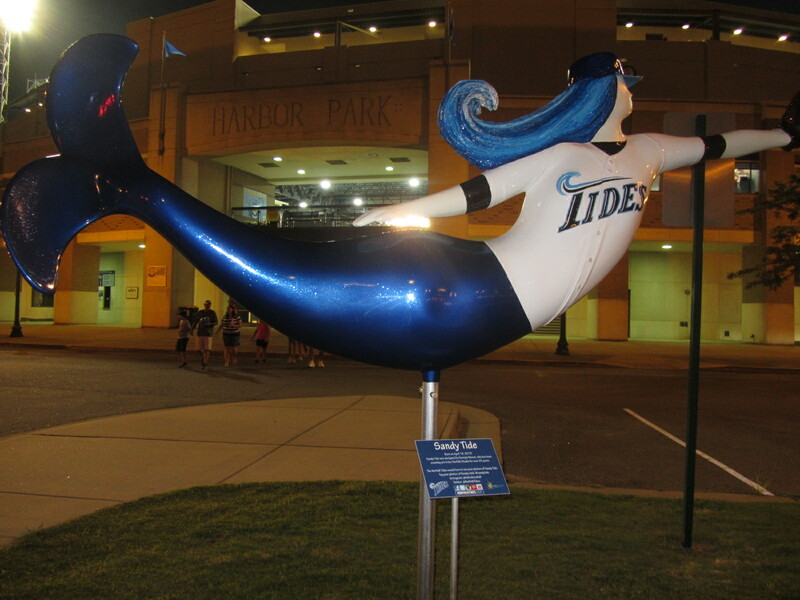 Or, barring that, do you know where the nearest mermaid statue is? This, entitled “Sandy Tide” (maybe she’s related to Rip Tide?) was designed by local artist Georgia Mason. It made its debut at the ballpark on April 18, 2015. It looks good at night. I guess I had enough to write about after all.